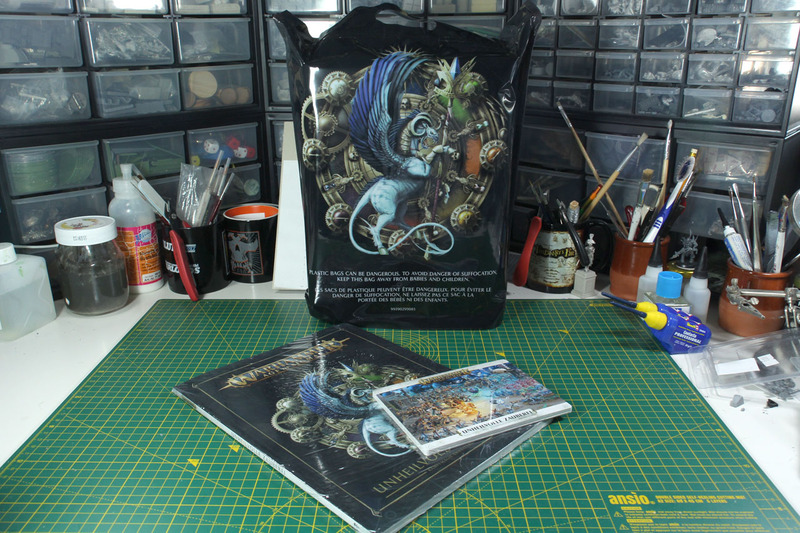 With the second edition of Warhammer Age of Sigmar the magic "came back" to Warhammer. 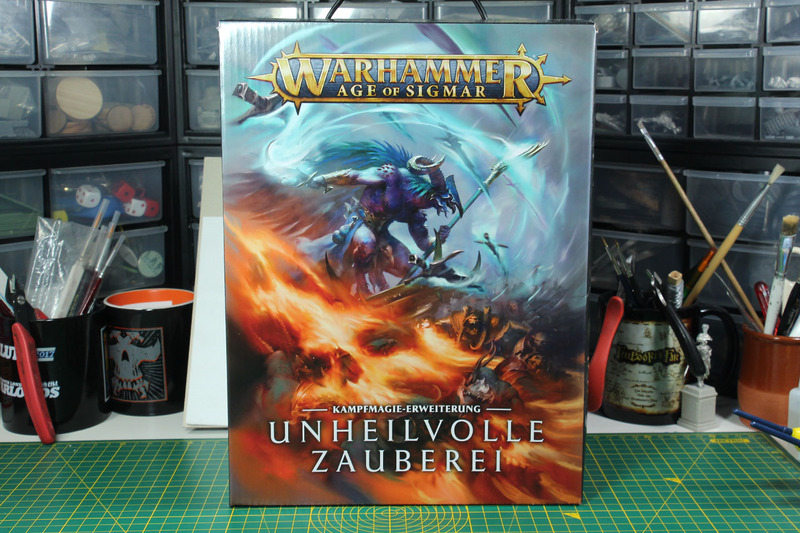 With Malign Sorcery Games Workshop released the first full magic supplement for Age of Sigmar and the latest since the 4th/5th edition of Warhammer Fantasy Battle. Let me show you the contents of this box in this unboxing review. 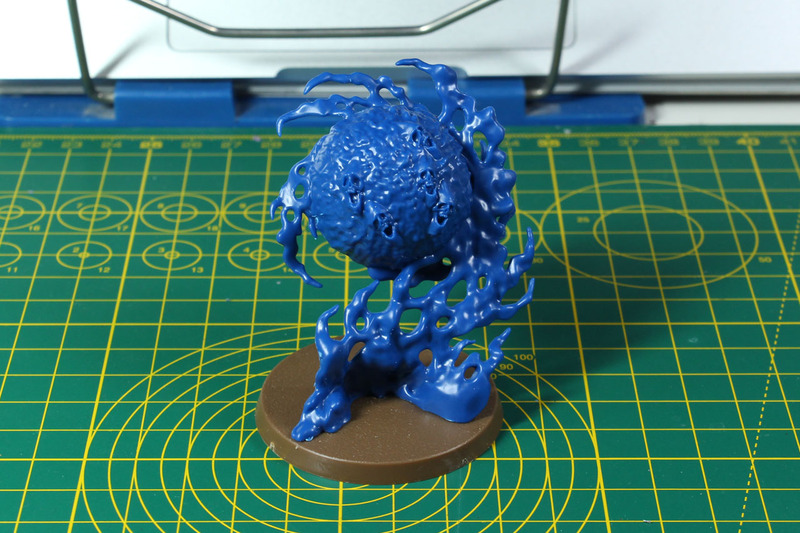 Malign Sorcery was released along the Soul Wars and is 60 EUR. 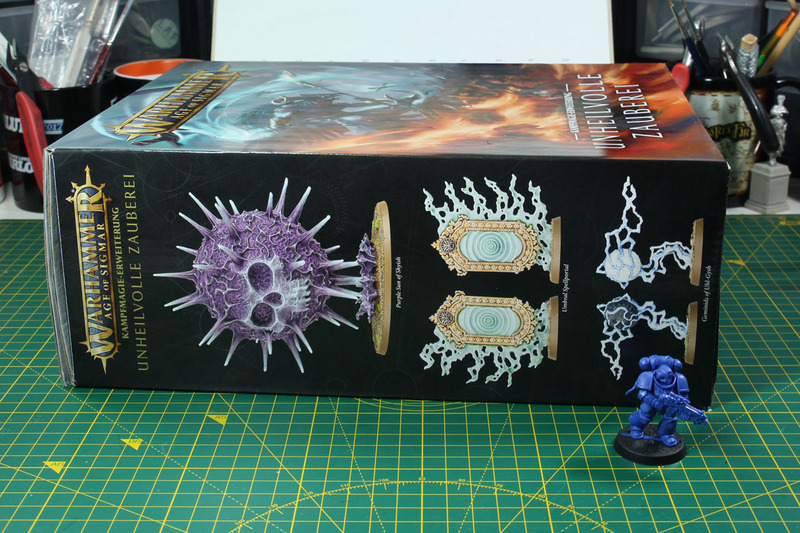 The box is rather huge, as you can see from the comparison to a Primaris Space Marine. 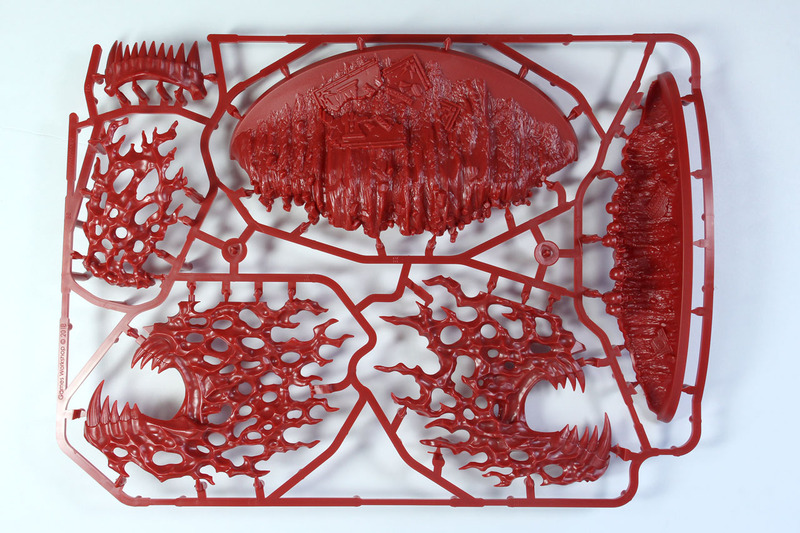 Inside the huge card board box is a sealed bag, which contains the sprues, the rule set for Malign Sorcery, the assembly instructions and the magic cards. 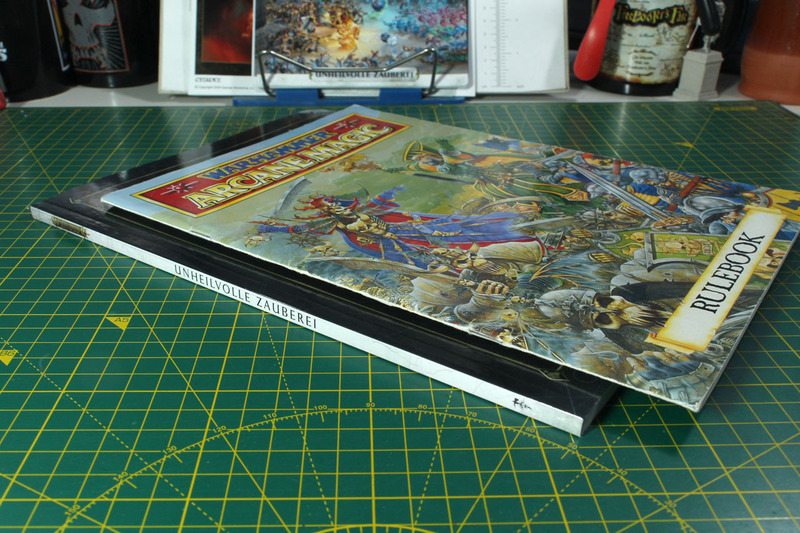 The rule book of Malign Sorcery is a full coloured 88 pages soft cover and covers beside the rules for the spells, scenarios and background information / lore, along with great battle scenes. 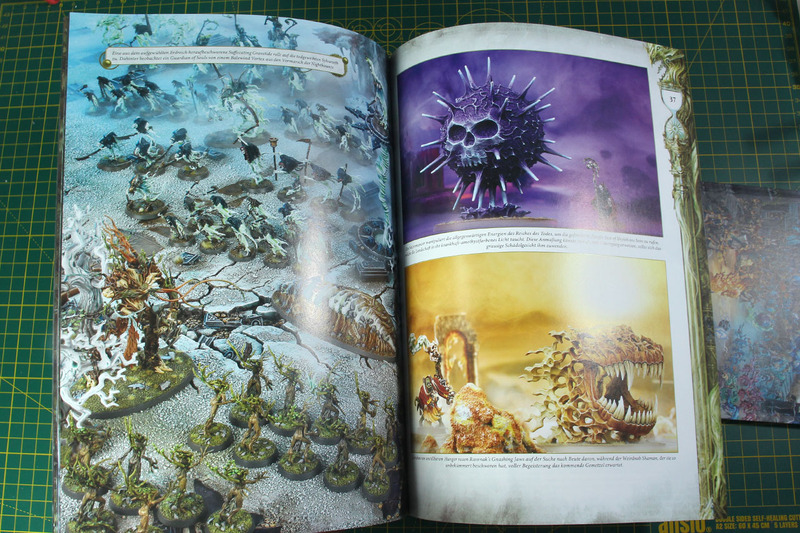 It covers extensively the lore of the magic winds of the Age of Sigmar realm, very colourful with a lot of depth. And it explains these new permanent spells. 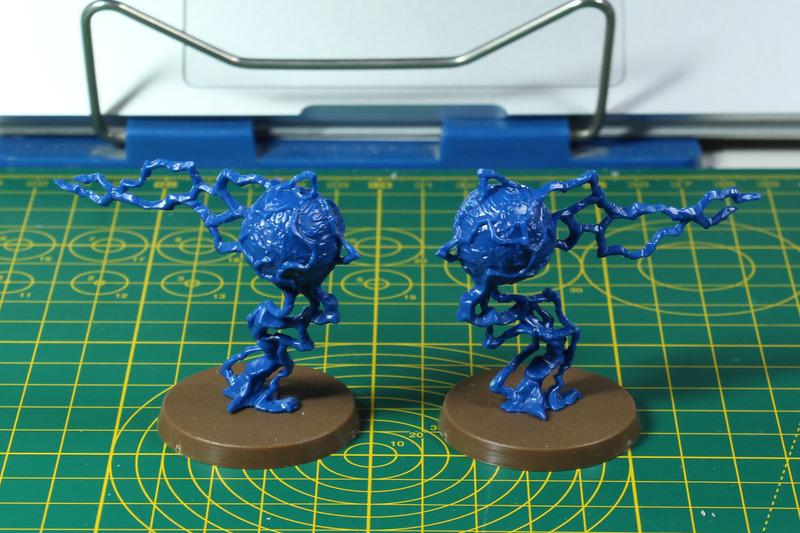 Because Malign Sorcery is about these permanent spells, that stay in the game until they are dispelled or out of bound and that is the reason why they have miniatures and their own supplement. 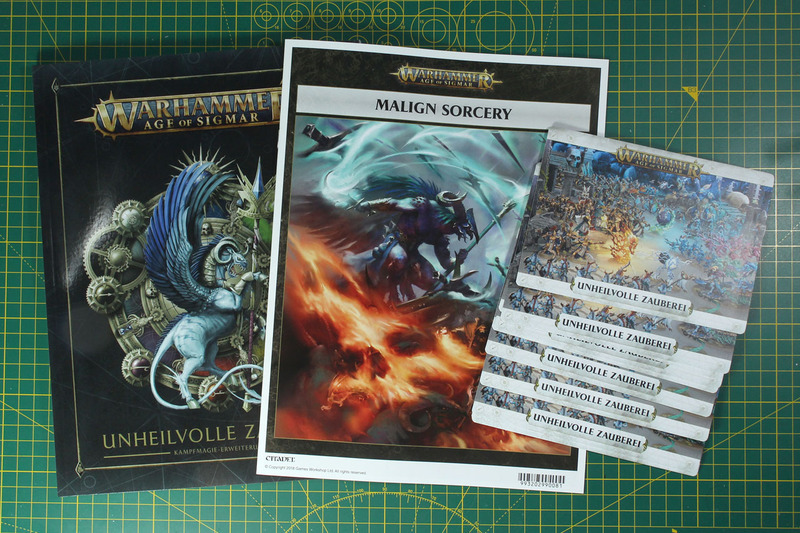 In addition to this extensive coverage of the lore, you receive rules for the use of Magic with the Skirmish and Paths to Glory in the Realm's Edge, and even more as you find 7 sets of spells for the regular Age of Sigmar rule set and even a list of magic items, called Artefacts of the Realms, split into different shorter list for the different Mortal Realms. And there are a total of 10 scenarios (called Battleplans) in Malign Sorcery. 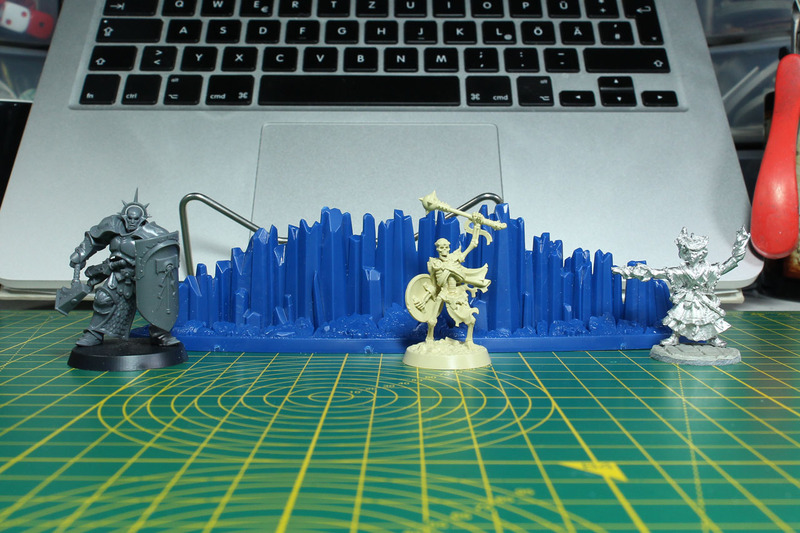 So a lot of content, for different play styles of Age of Sigmar. There are 14 large spell cards in the size of post cards, covering the rules and tag words of the several permanent spells. 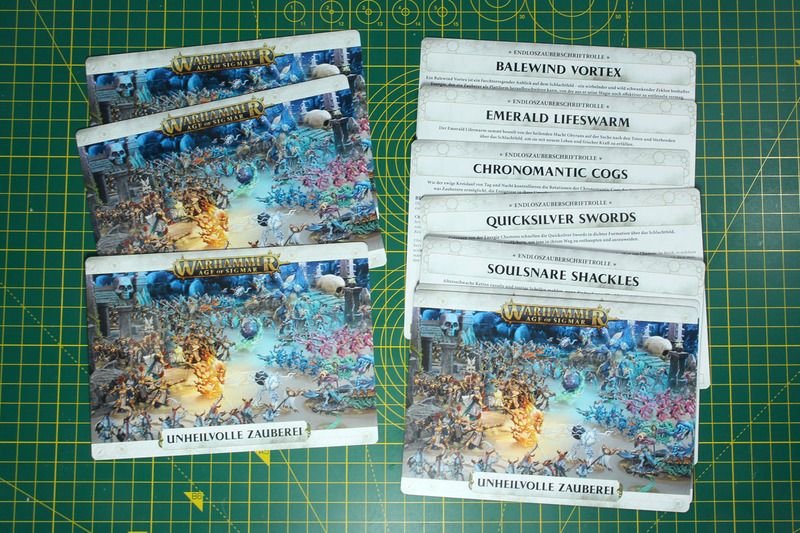 And covering beside the 13 spells that are included in this set, a 14th spell cards for the Balewind Vortex. 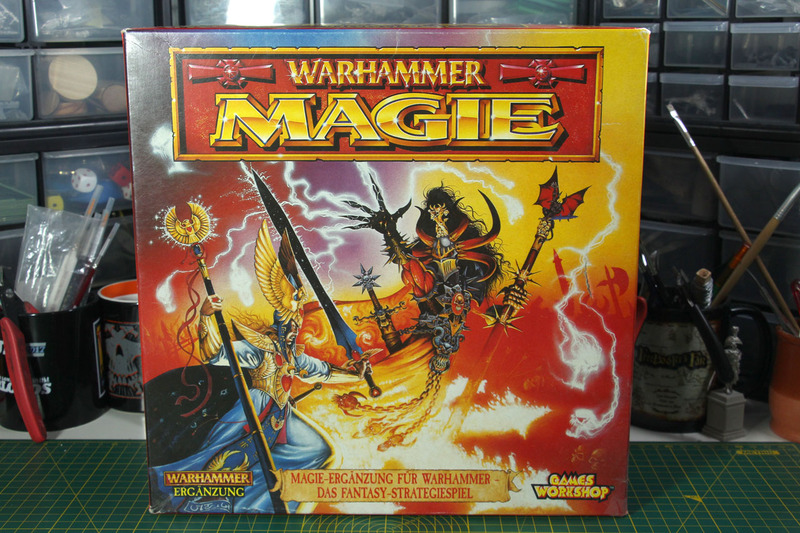 Back in 1992 the last magic supplement was released for the 4th edition of Warhammer, and it was called Battle Magic and there was an additional book called Arcane Magic. 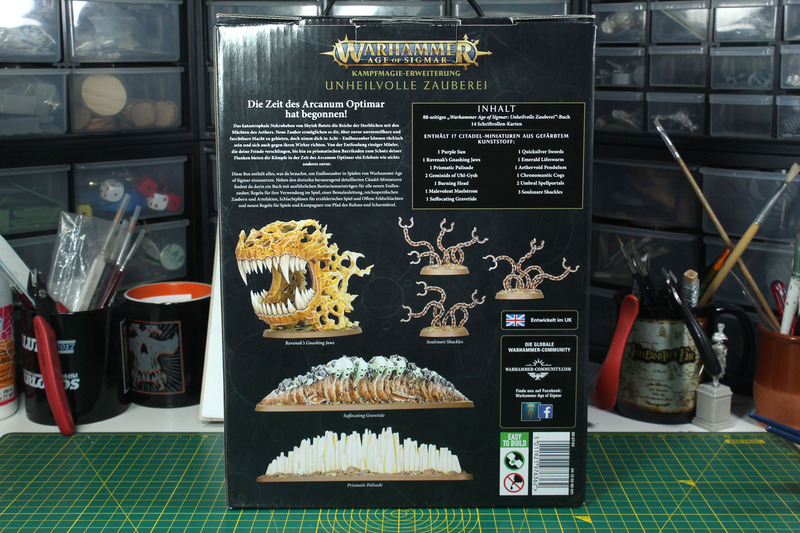 In Germany the two releases were consolidated and released as a boxed set called "Warhammer Magie". 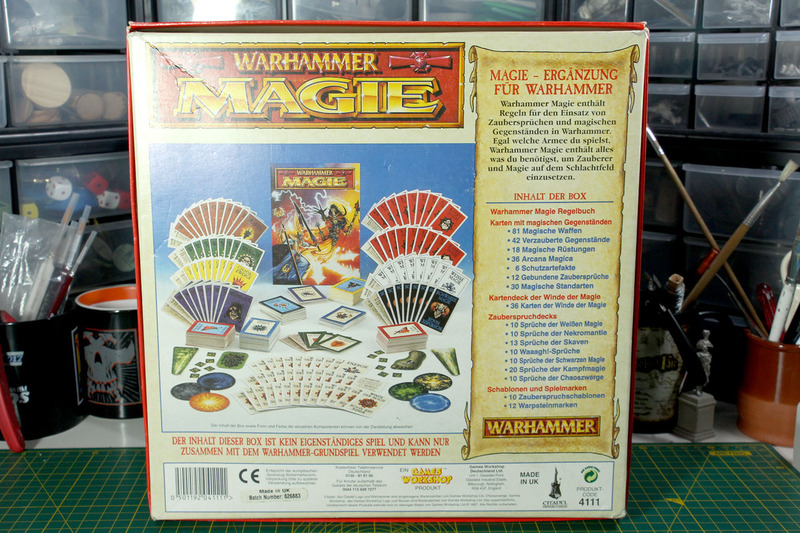 It had a rule book, 225 magic cards, 36 wind of magic cards, 83 spell cards and 12 templates for magic spells. And it was roughly 40 EUR (80 DM) when it was available. As you can see, the Malign Sorcery book is significally thicker than the old Arcane Magic book. 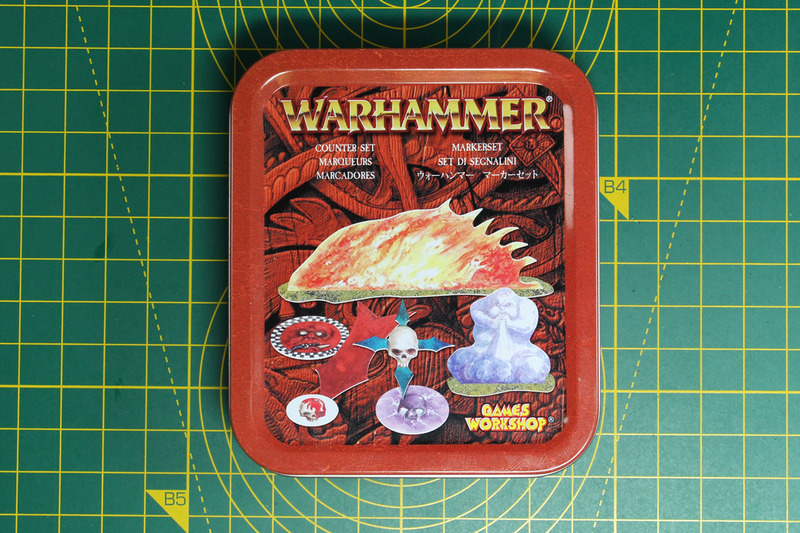 In the later editions were card decks available for the several factions and types of magic of the Warhammer World. And there was a token set with some plastic card punch outs to mark the effects of magic spells. So you see, not everything was better in the past. 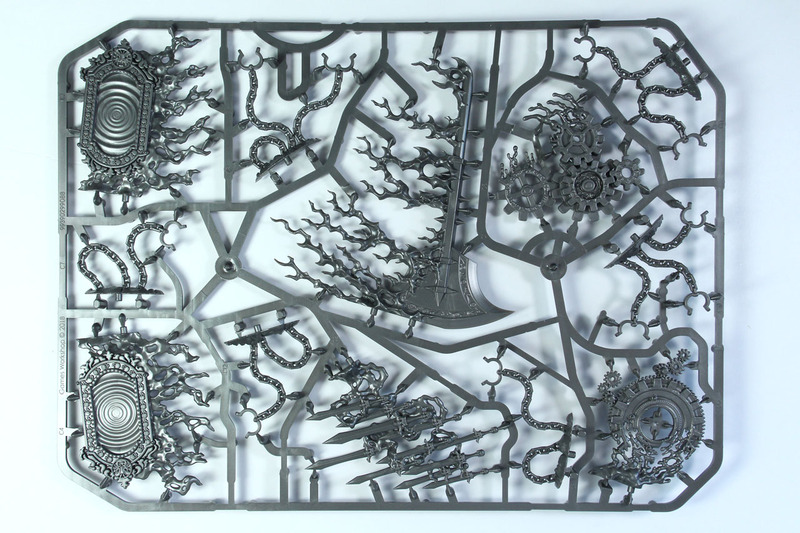 Malign Sorcery covers a huge stack of sprues. All of them pre-coloured for easier use / getting them battle ready faster. 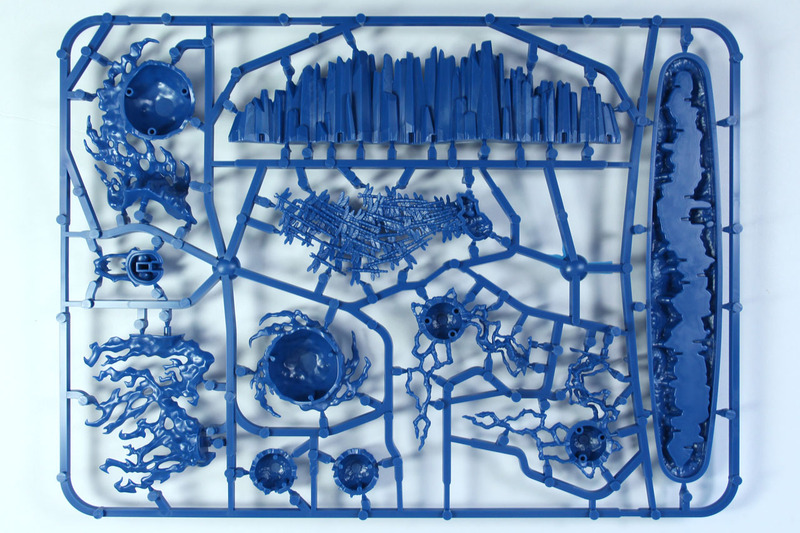 There is a large sprue with bases of different sizes and forms for the spells (some spells like the Geminids of Uhl-Gysh come with multiple "miniatures" and others like the Prismatic Palisade have their own bases in the pre-coloured sprues). 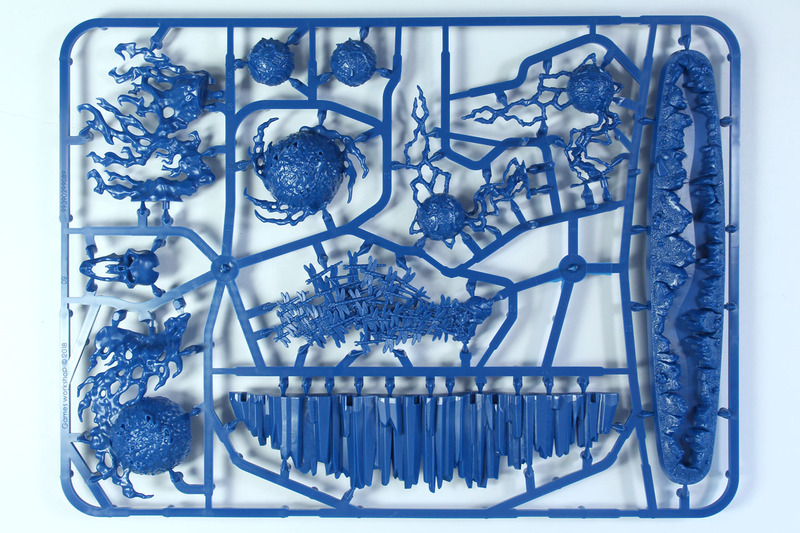 The blue sprue covers the Emerald Lifeswarm, Geminids of Uhl-Gysh, Prismatic Palisade, The Burning Head and Malevolent Maelstrom. 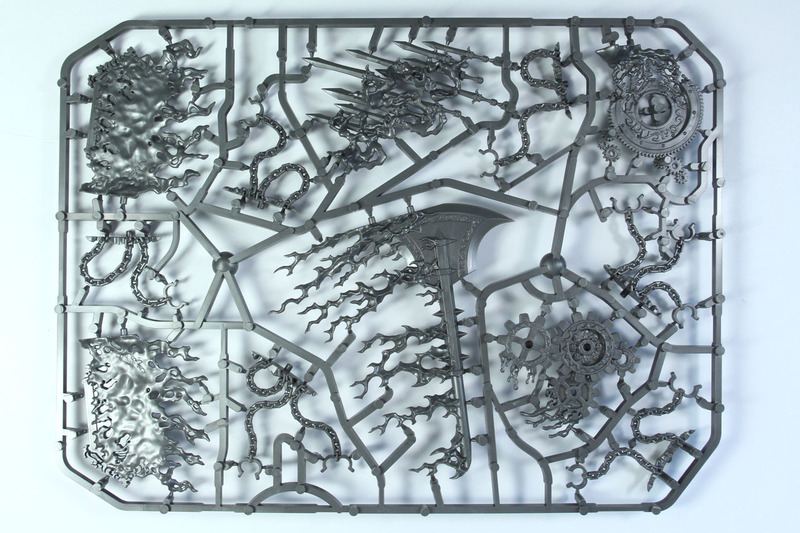 In the silver-grey sprue you find the parts for the Chronomantic Cogs, Quicksilver Swords, Umbral Spellportal, Soulsnare Shackles and Aethervoid Pendulum. 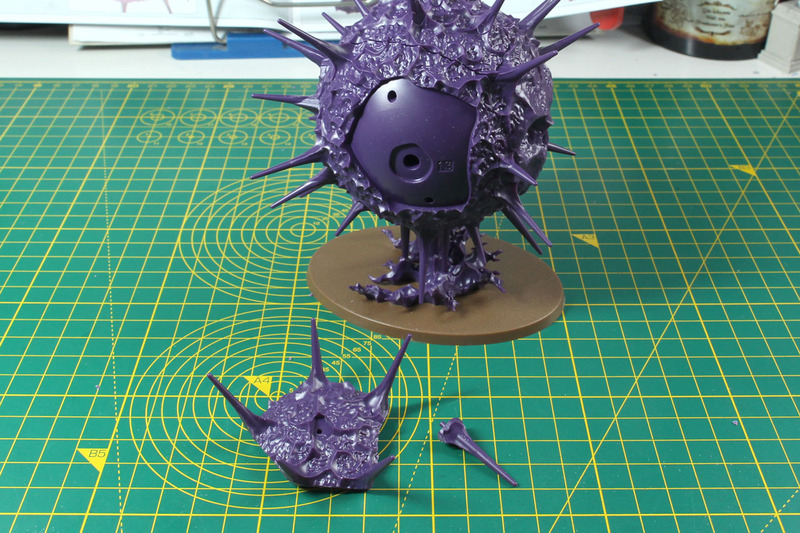 The Purple Sun of Shyish covers an entire purple frame for itself, along with a smaller for the inner construct. 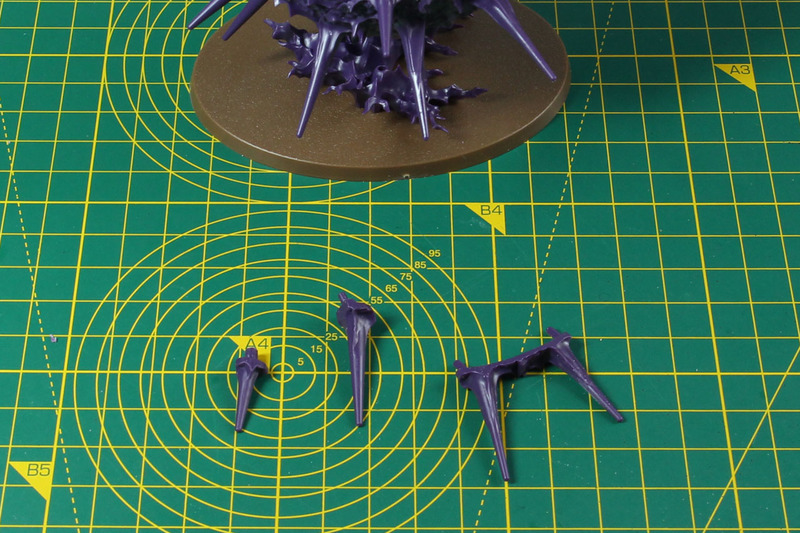 As Suffocating Gravetide and Ravenak's Ghnashing Jaws are larger spells, only two of them fit in the red sprue. 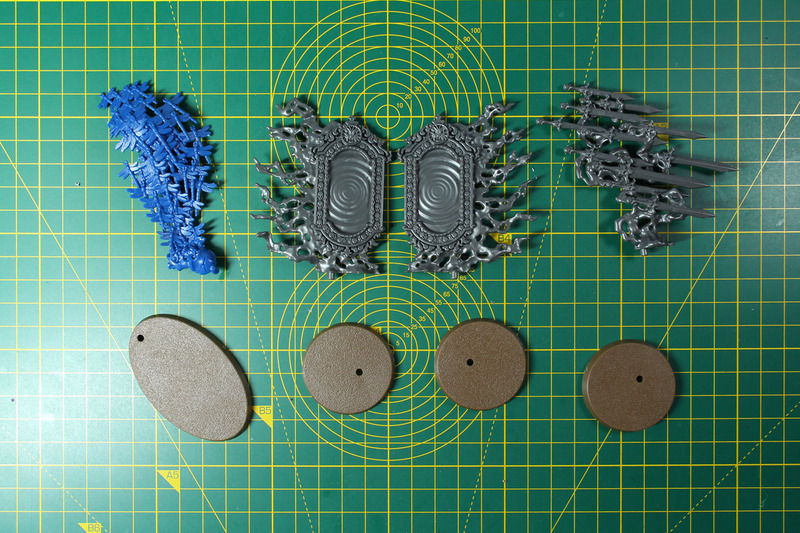 And the whole lot of parts spread out on the cutting mat. 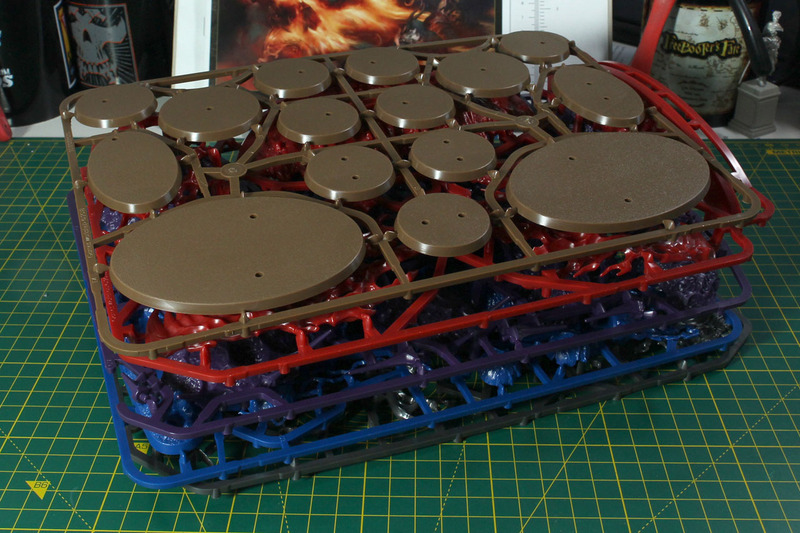 Quite the large array of parts. 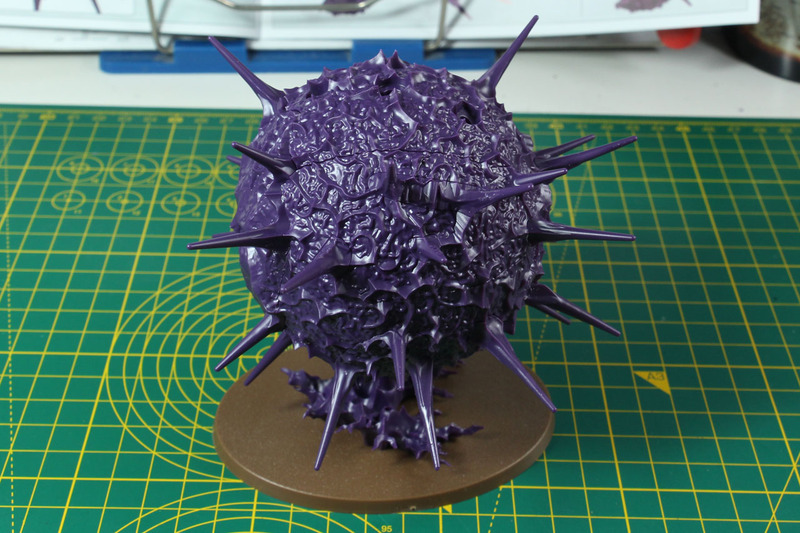 The centre piece of the Malign Sorcery set is most likely the Purple Sun of Shyish. 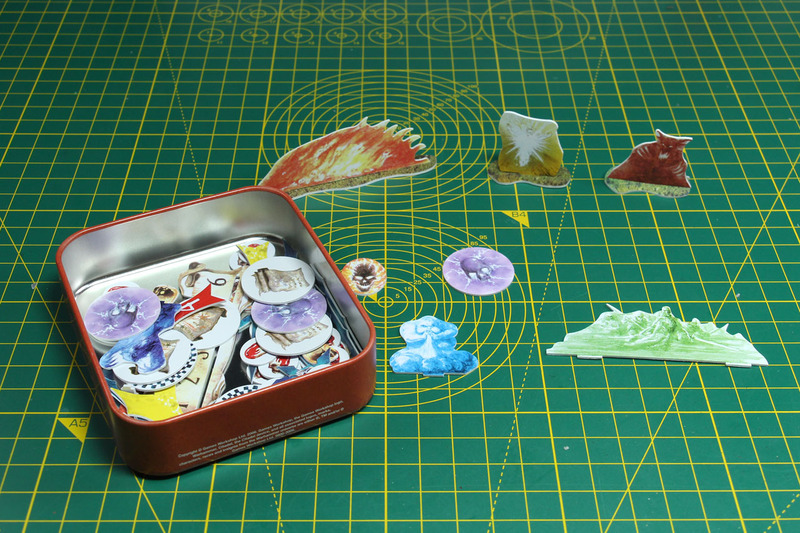 All spell miniatures in this box are push-fit, so you wouldn't need glue to build them, you can just push them together. 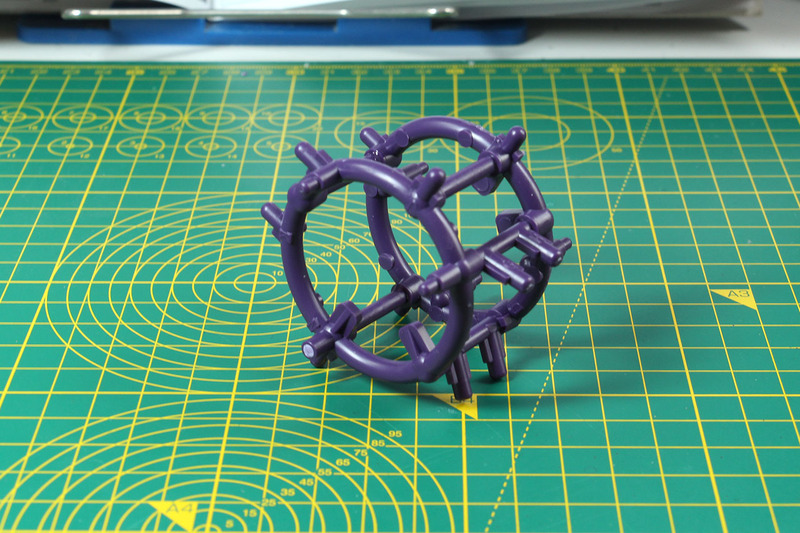 Even though the plastic is coloured, it works like the regular grey plastic with simple plastic glue. 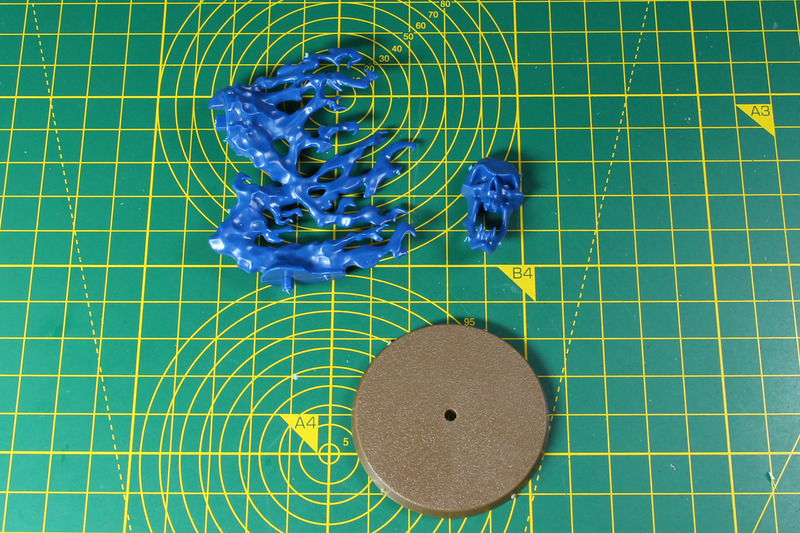 The sub structure of the Sun consists of two circles and a couple of pins, which have pins to every direction where the other, outer parts are added to. I broke of one of the pins while doing a dry fit and it got stuck on the other side of the part. 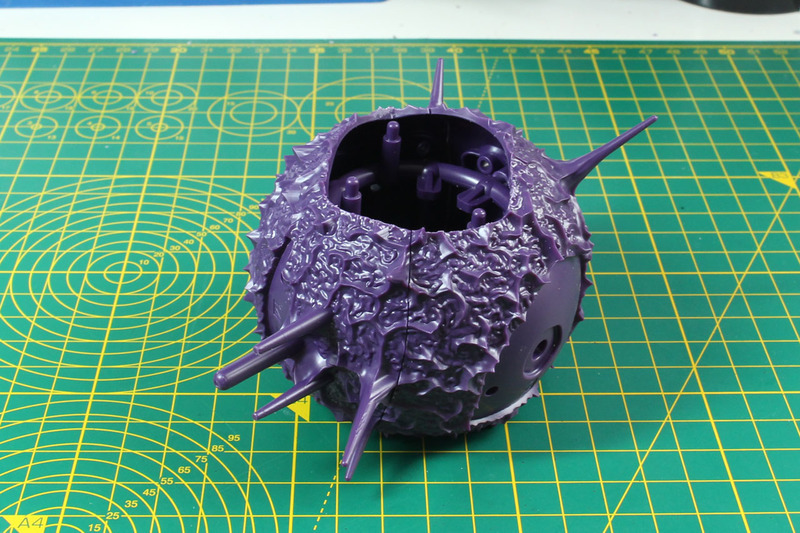 No big deal, simply glue the parts together. 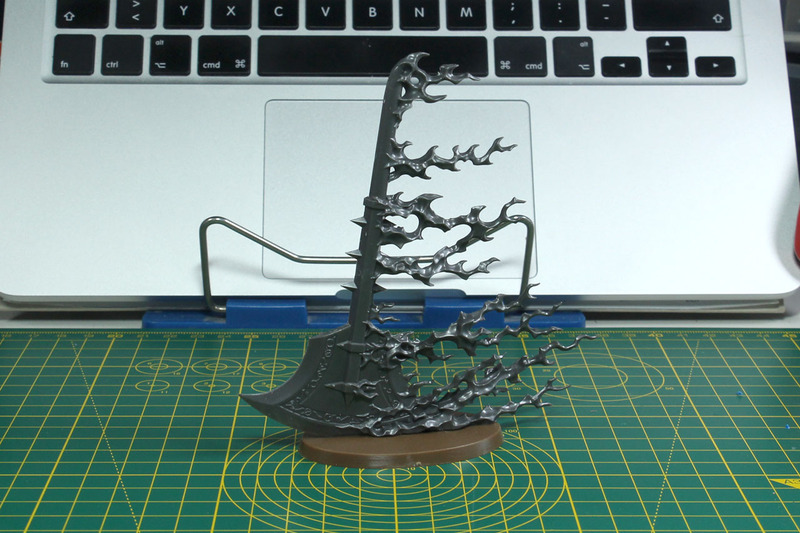 As a couple of people that already got their Malign Sorcery set talked about problems with the fit and gaps on this specific model, I took a bit of time to plan ahead and think about a way to get rid of that problem. 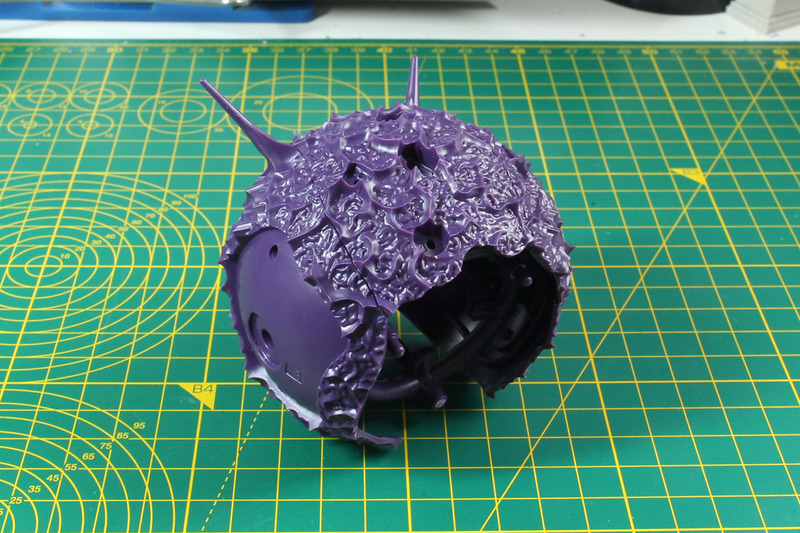 I came to the conclusion to do a dry fit, to see if every part goes together neatly with the parts around it. 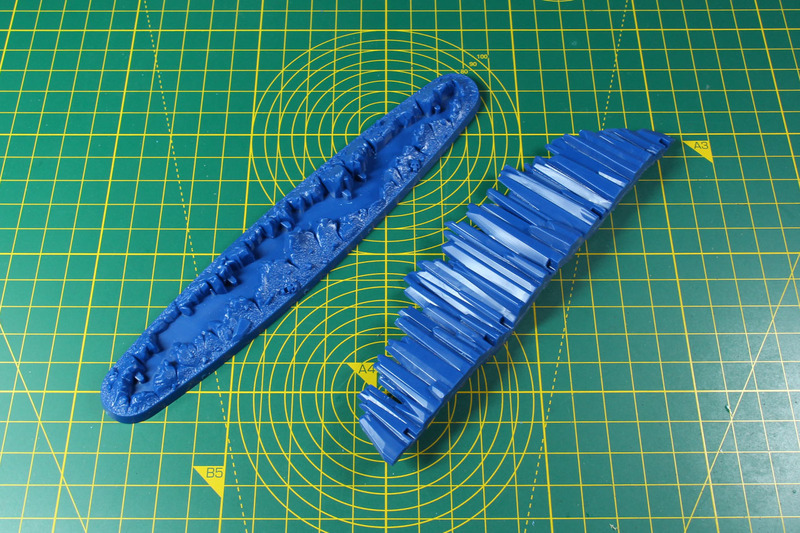 And they did, after I filed of any mould lines and remains of the sprue connections. 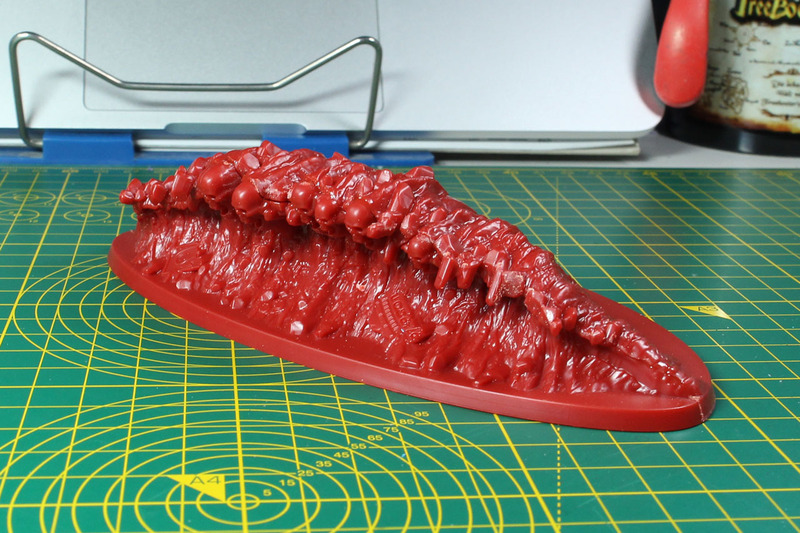 There is a base piece that helps you with the further steps. 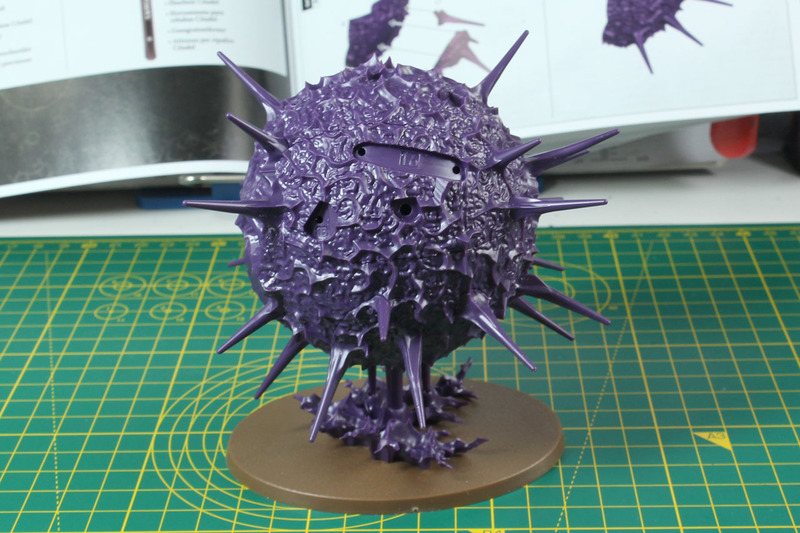 Just make sure not to glue it and just stick it in the base lightly, as further parts will be added that form a stable connection between the model itself and the base. 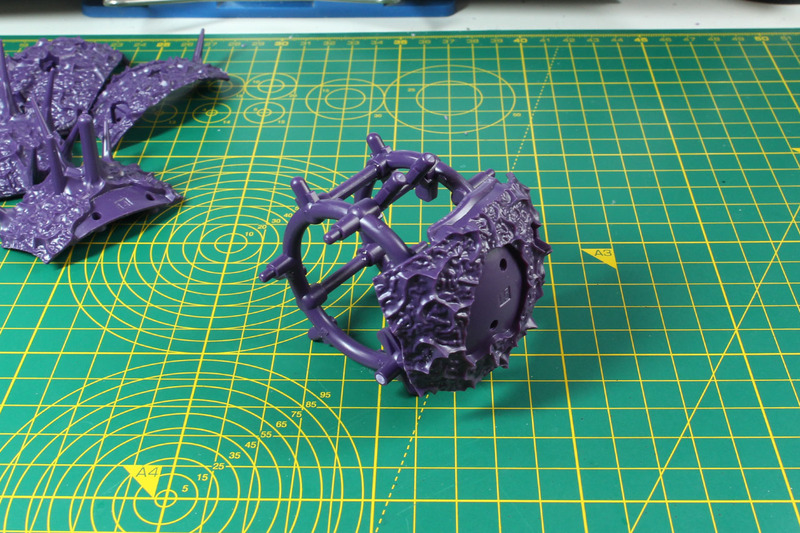 But the real trick behind getting this model assembled in a proper way is to rearrange the steps on the assembly instruction. 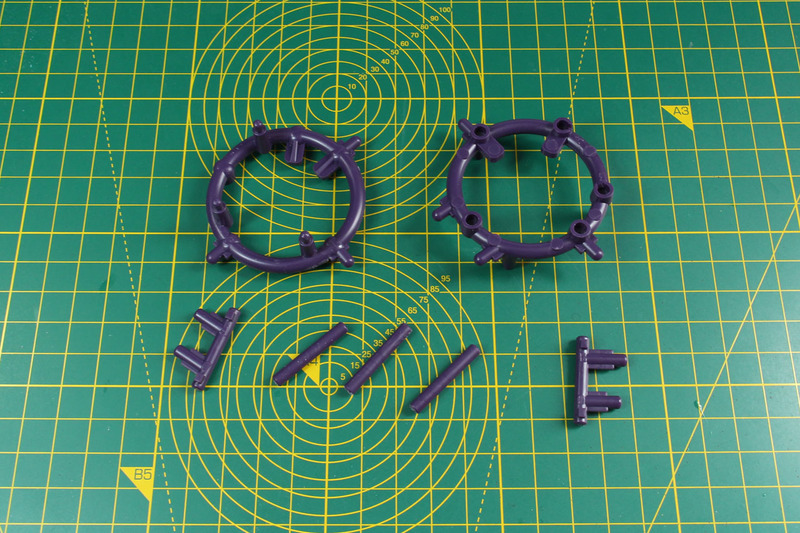 As mentioned above, these are push fit, so you need to be able to push the parts into each other for a snug fit. 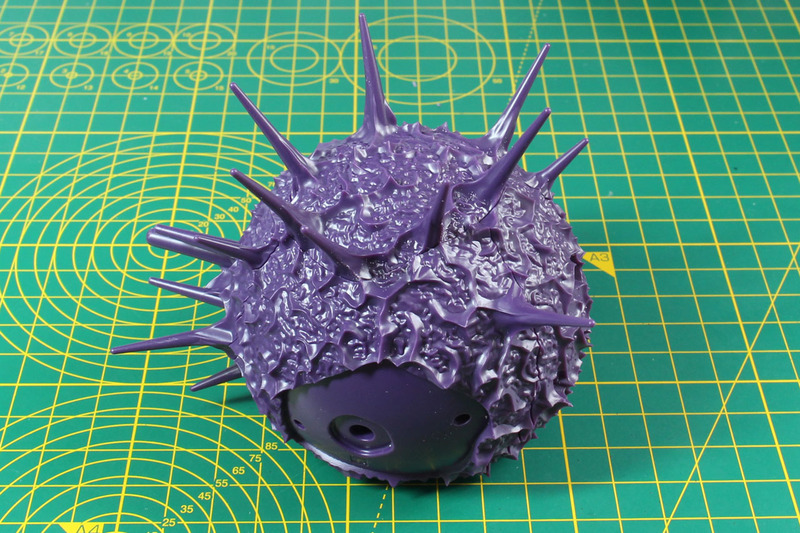 That is nearly impossible if you already glued all the sun beams / spikes into position, as you have no secure surface for your hands and fingers to add pressure. 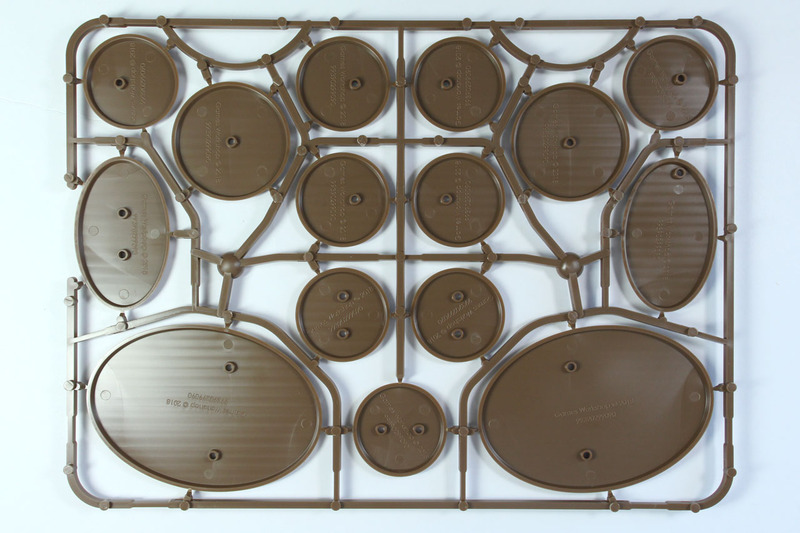 Just make sure, that you keep track of which part goes where, as this might become time consuming if you just cut them from the sprue without the numbers attached. 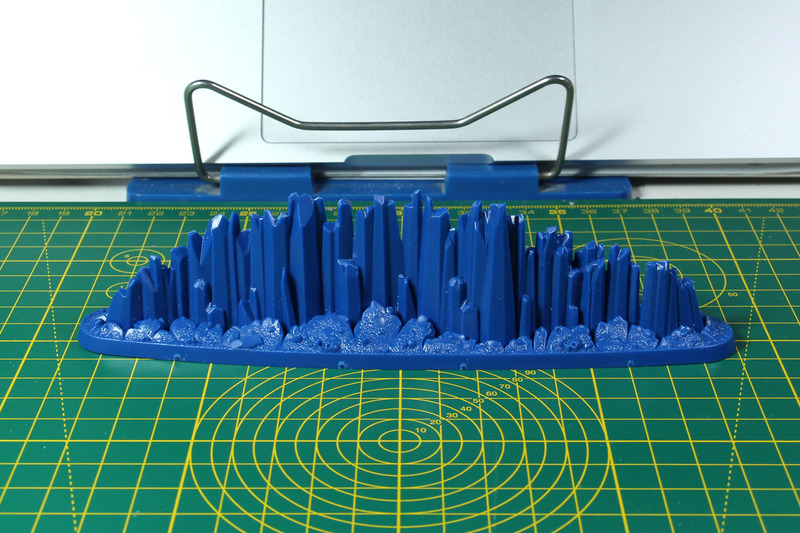 As you can see, minimal to no gaps, very satisfying result of the model. 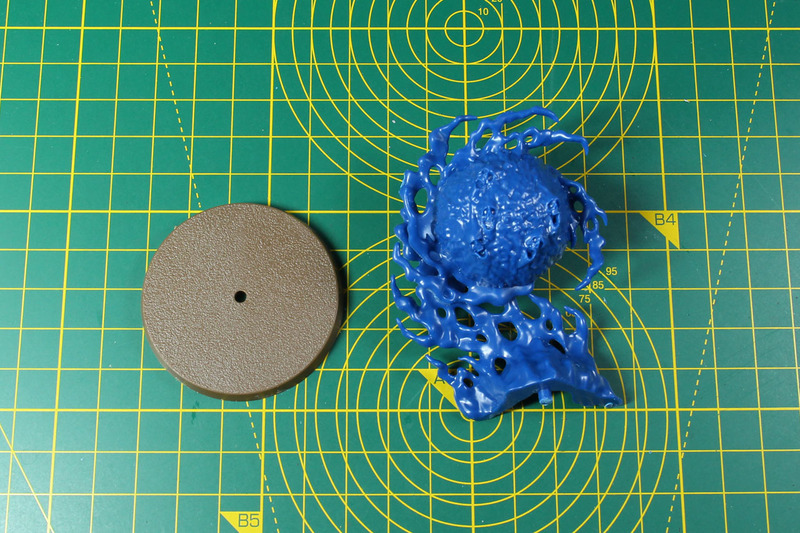 Quite impressed by the size, the core sphere is larger than a Tennis ball. 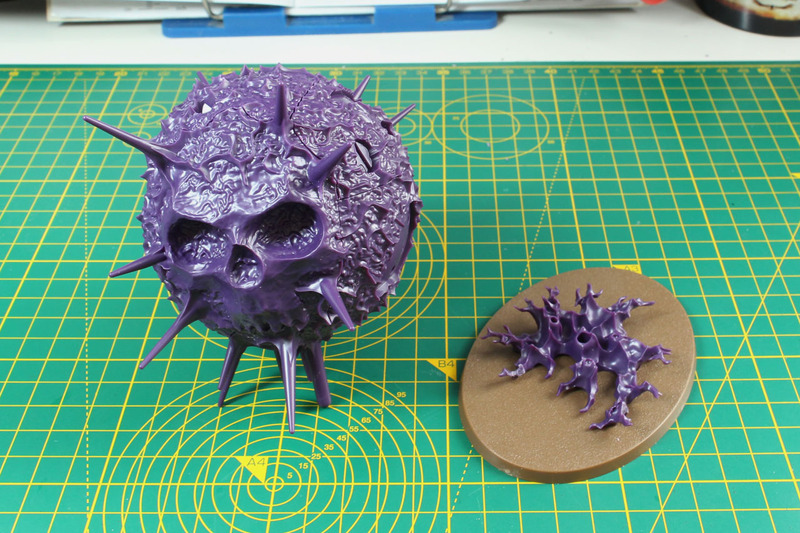 The rules for the Purple Sun of Shyish show it as an orb of death that moves 9" and eliminates models that it came along on a 6. And in the realms of death it moves even faster. 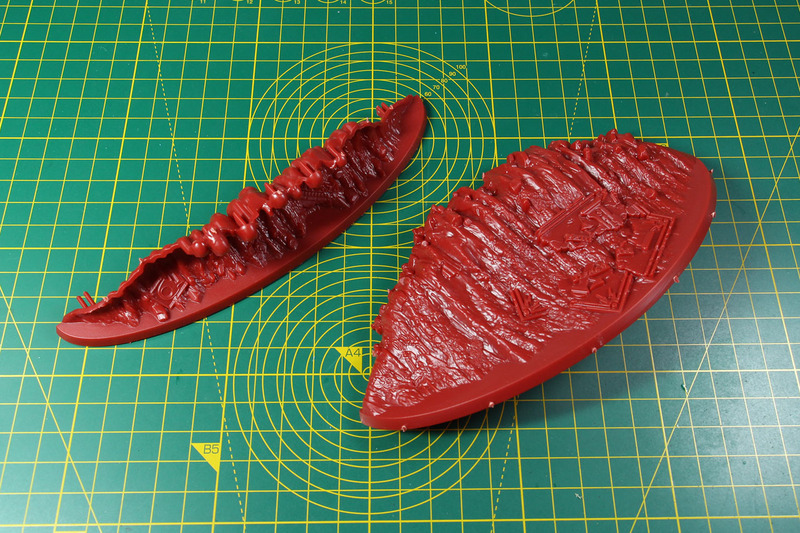 After such an "intense" multipart experience, a few single part models, that are just added to the base. 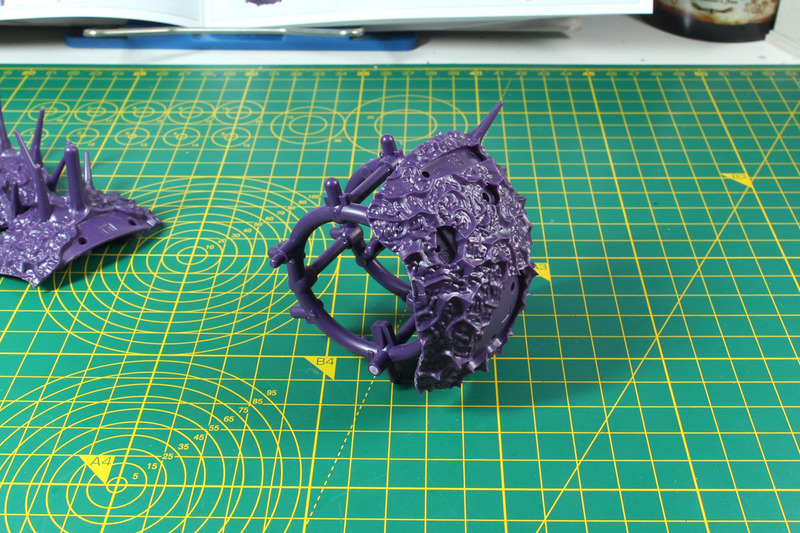 In this case the Emerald Lifeswarm, Quicksilver Swords and Umbral Spellportal. 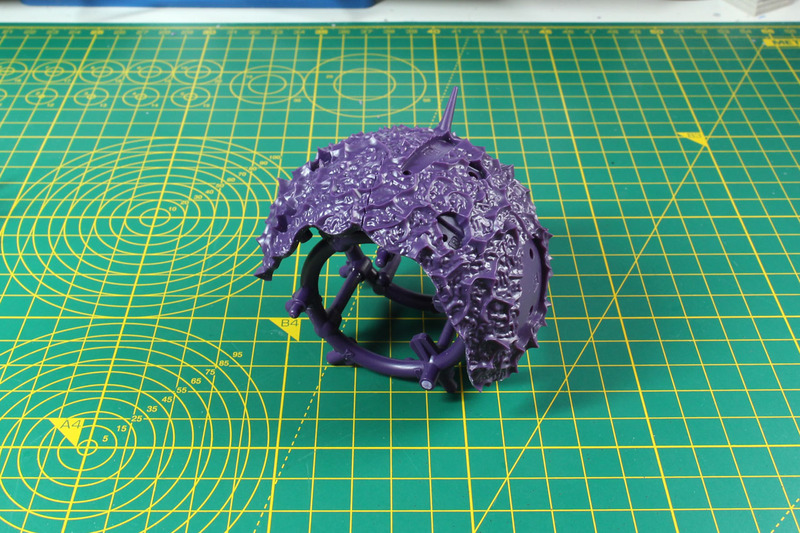 With the Lifeswarm I expected something like a swarm of locusts that deal damage. 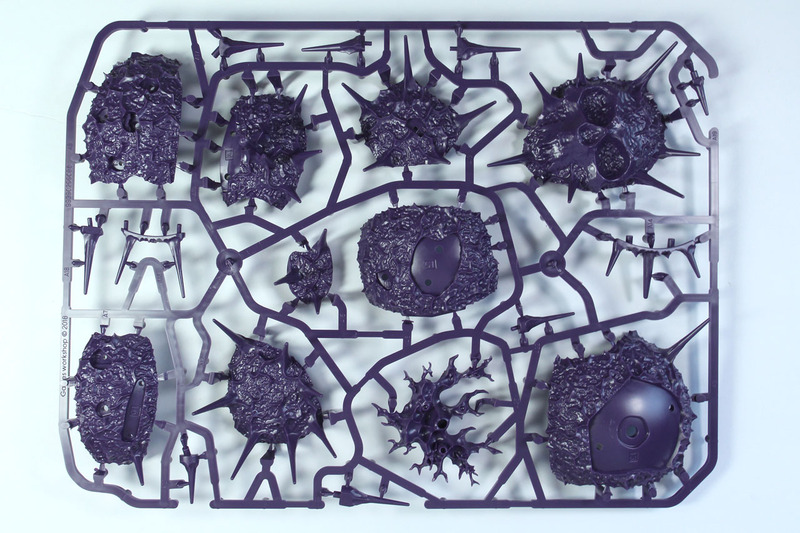 But this is a life swarm, so it moves around and heals models and units it touches, and is even more effective in the realm of life. With the Umbral Spellportal it is similar, it is not about teleporting units, it is about teleporting spells. It increases the range of spells accordingly and even makes permanent spells move through the spellportal. It benefits from being played in the realm of shadows. Imagine the Quicksilver Swords as a rain of blades, as you throw 12 dice and for each roll of 6+ you cause a deadly wound. 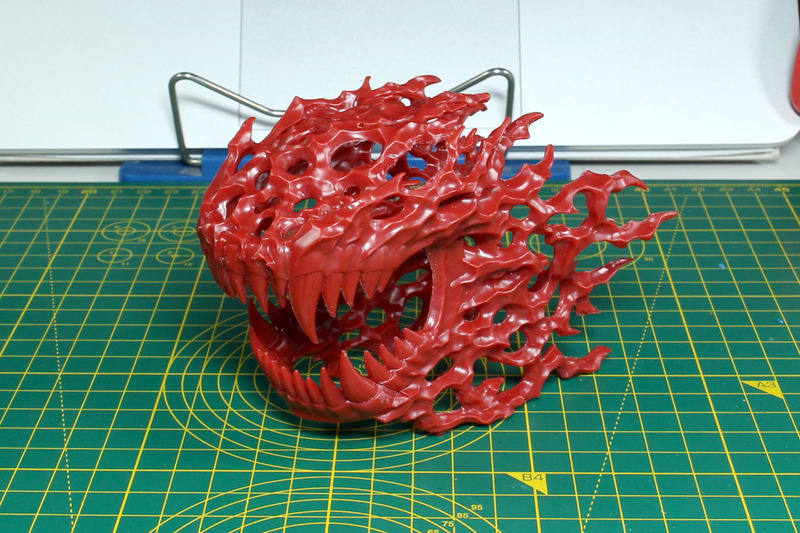 It gets +3 dice in the realm of metal. 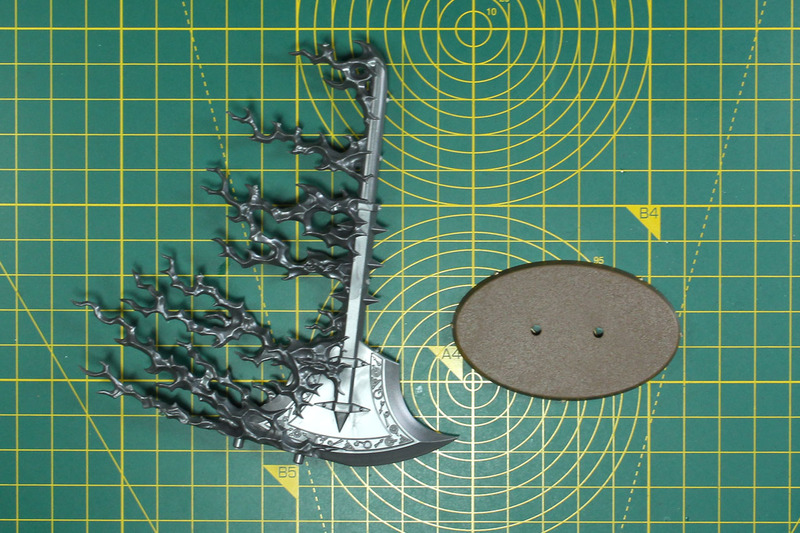 Another spell that is just a single part that has to be glued to the base is the Aethervoid Pendulum. The rules are similar to the Quicksilver Swords, but instead of two handful of dice, it throws a single die to determine the amount of damage it deals. 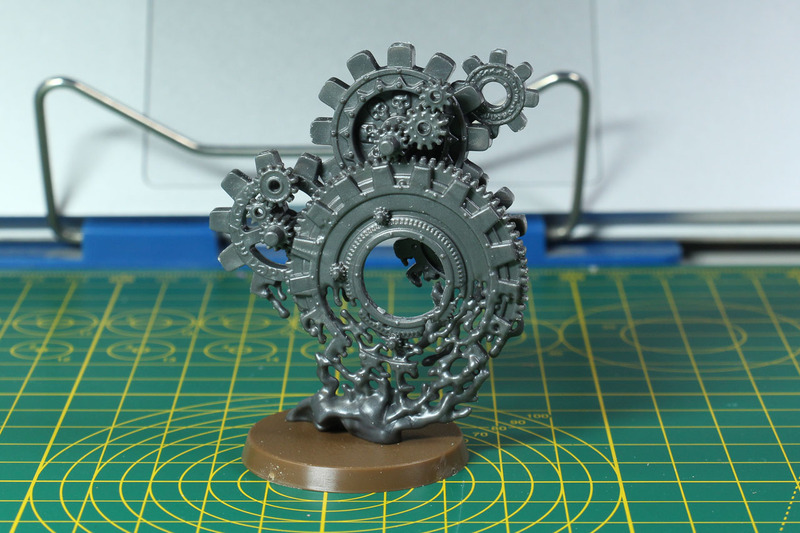 I could really see this miniature being used to convert a Screaming Bell into a different kind of Skaven siege engine. The Geminids of Uhl-Gysh, looks a bit like Ball Lightning from Diablo, are two two-piece thunder balls. 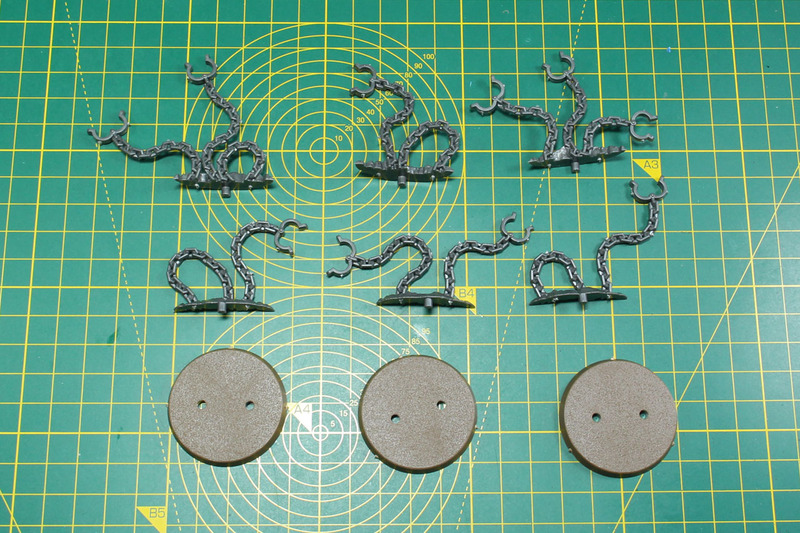 Easy to assemble and most likely quite easy to paint, as a simple white dry brush might give you a satisfying result. These are a twin spells, so one is the Light Geminid and the other the Shadow Geminid, they have similar rules with the Shadow Geminid giving mali on close combat weapons and the Light Geminid on hit rolls of the units they came across. They benefit from being used in the realm of light and shadow. 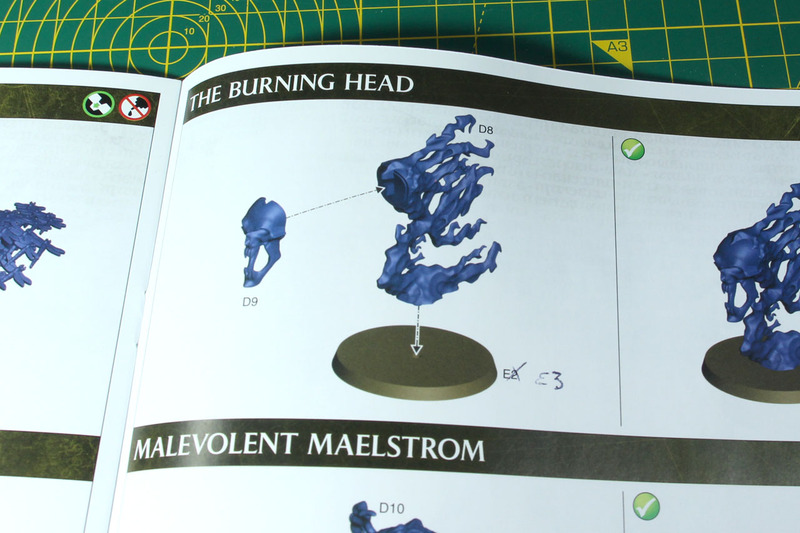 Malevolent Maelstrom, looks a bit like the larger variant of the Geminids above, but is a soul leaching orb. It loads up on it eliminates nearby units and detonates in a huge vortex on a 7+. 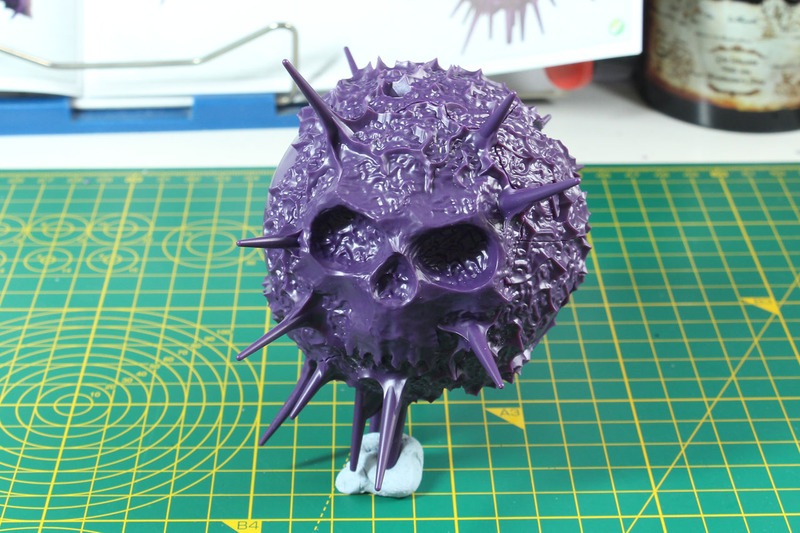 As this is quite deadly, it benefits from being casted in the realm of death. 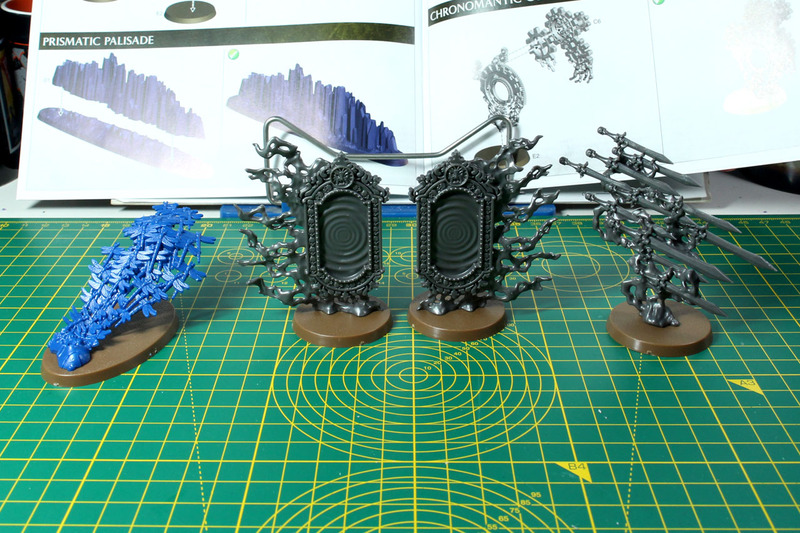 The next two are "barrier spells", the Prismatic Palisade is a barrier of light and causes blinds nearby units. As such it is more effective in the realm of light. It could be painted like a frost wall and is quite impressive in size. 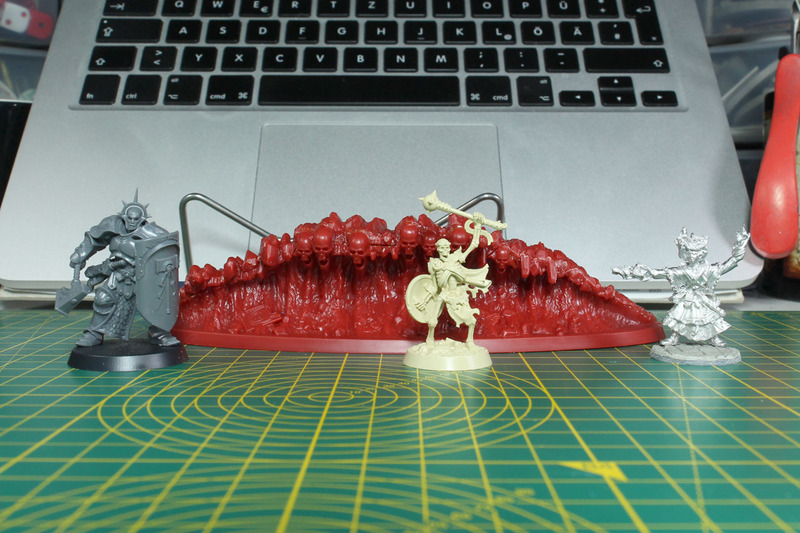 You'll see that further below in the scale comparison. And the Suffocating Gravetide, a wave of earth and what lies in that earth. Fitting name and will look great in the earthy colours. 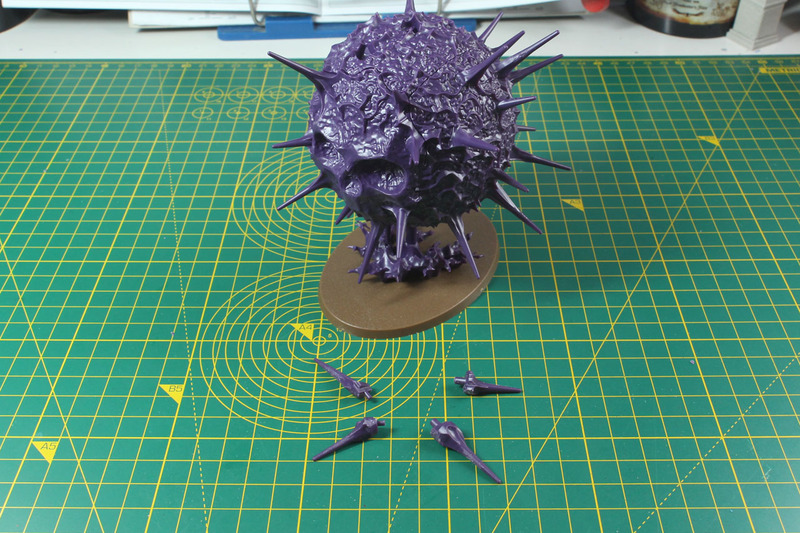 Rule wise it is a large template spell, that causes D3 deadly wounds to any unit it moved across during the turn. 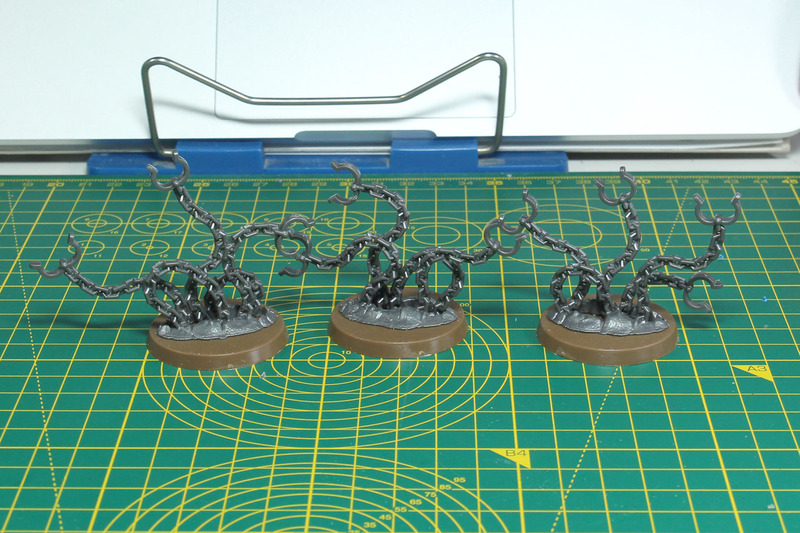 The gravetide is moving faster in the realm of death. After these two I was a bit surprised that there was no firewall spell in here. But maybe that will be included in one of the faction specific spell sets, for examples with the Aelves of the Phoenix Temple. 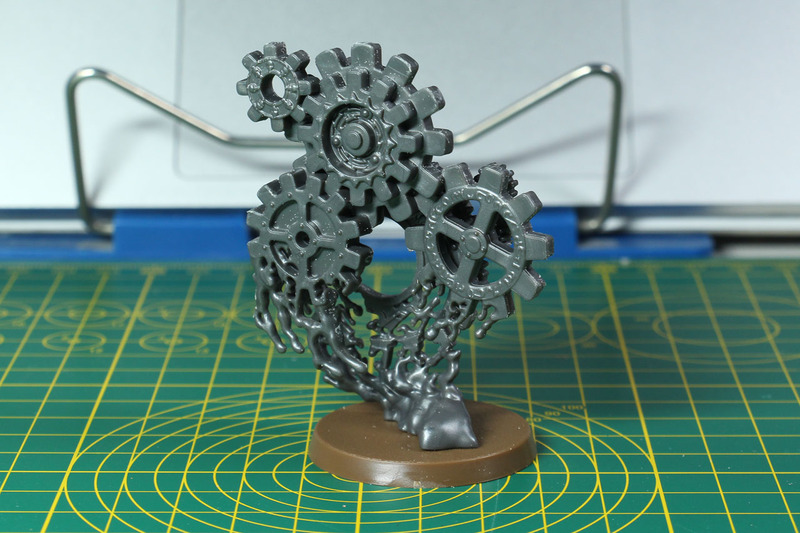 Chronomantic Cogs manipulate time, can slow it down or let it move faster. As such either all units on the battle field benefit from faster movement and +2 on attack rolls, or the wizard who casted the permanent spell may reroll save rolls and cast an additional spell. 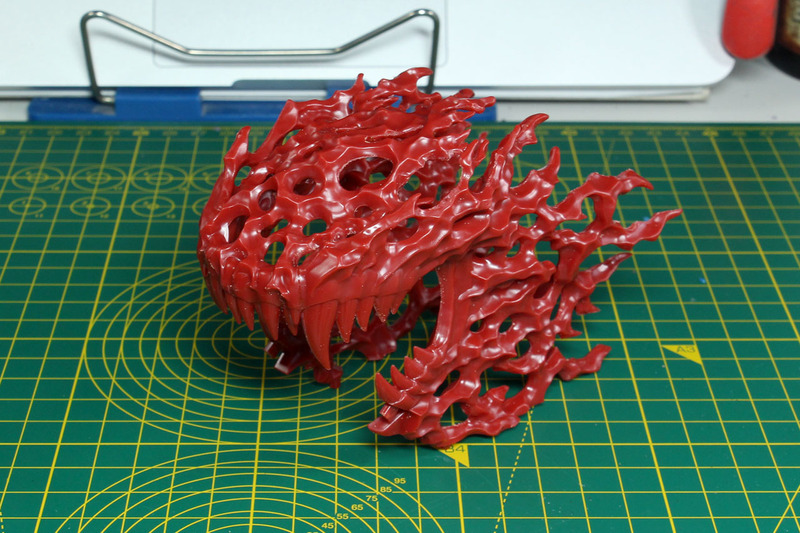 A flaming skull from the realm of fire is The Burning Head. 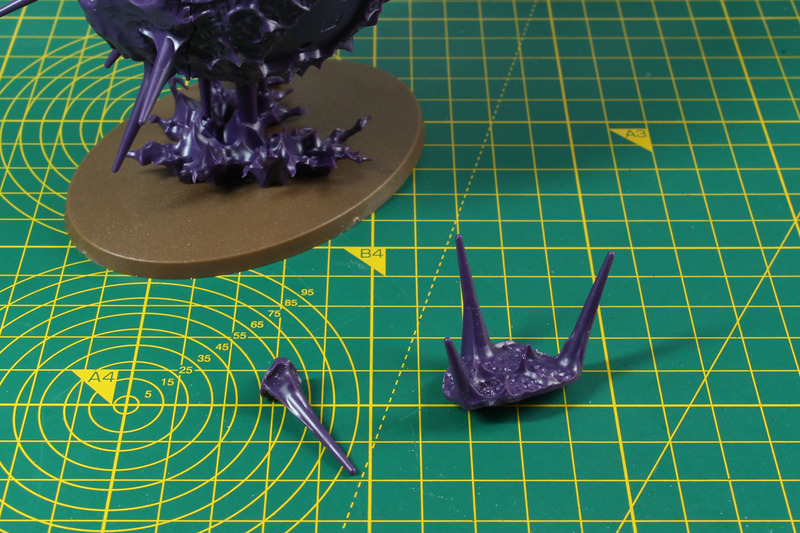 It cases D3 deadly wounds to nearby units and causes rage within 9", giving those units the opportunity to reroll hit rolls of 1. As this spell is related to the flames of Aqshys, it benefits from being casted in the realm of fire. 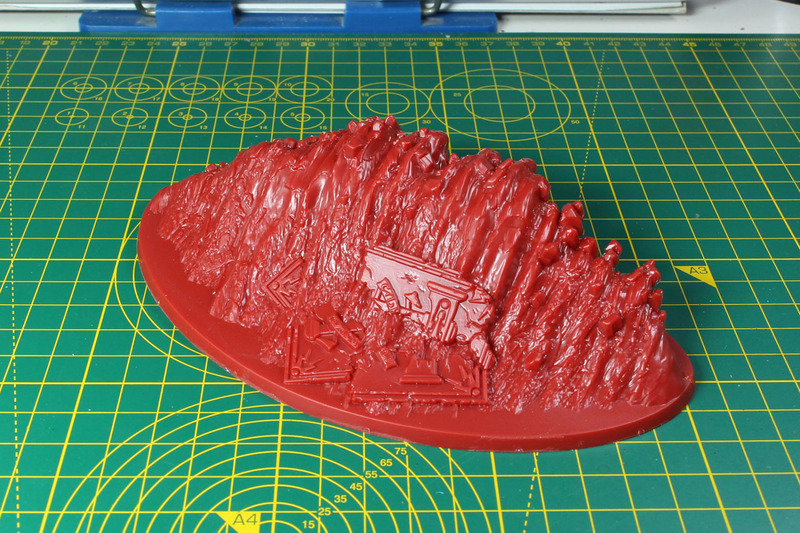 In the instructions of the Burning Head the base size is incorrect, it is the larger E3 not E2 base as shown in the instructions. 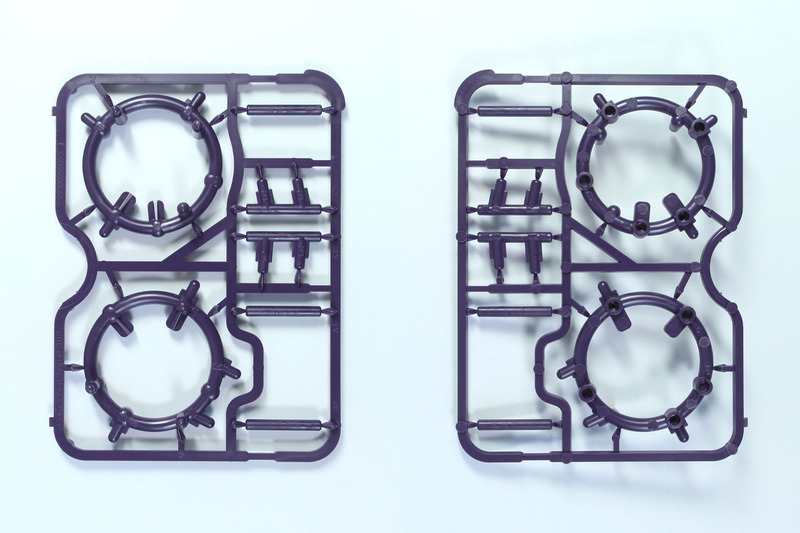 Make sure you match the right halfs of the Soulsnare Shackles while assembling. 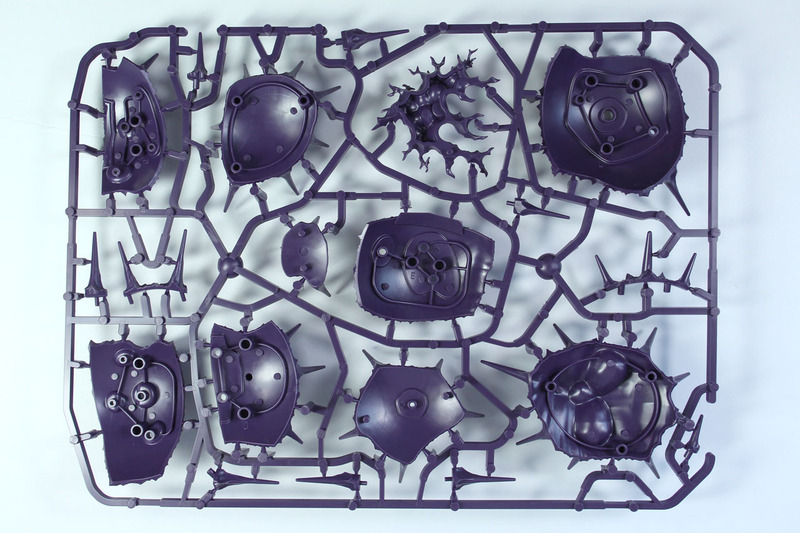 These shackles move across the battle field and trap models, to reduce their speed and in some worst cases even cause damage to them. They belong to the realm of death, and not how you would expect the realm of metal. 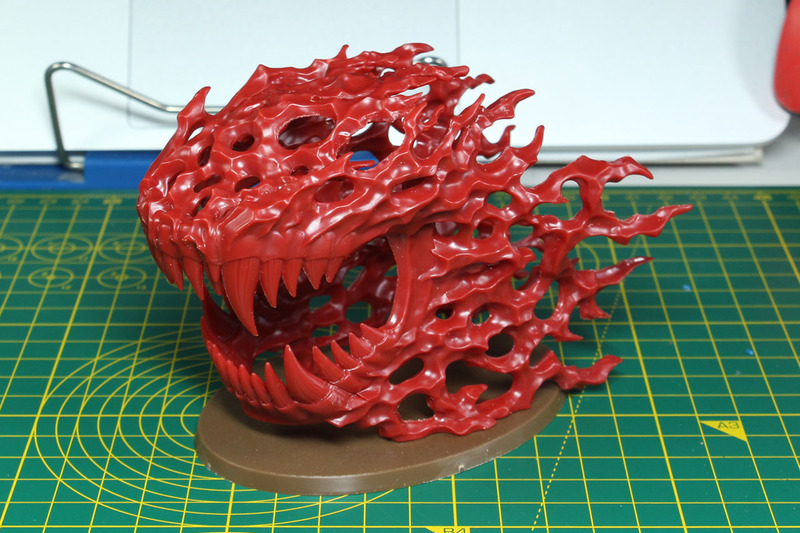 Another huge spell miniature in this kit is Ravenak's Ghnashing Jaws. 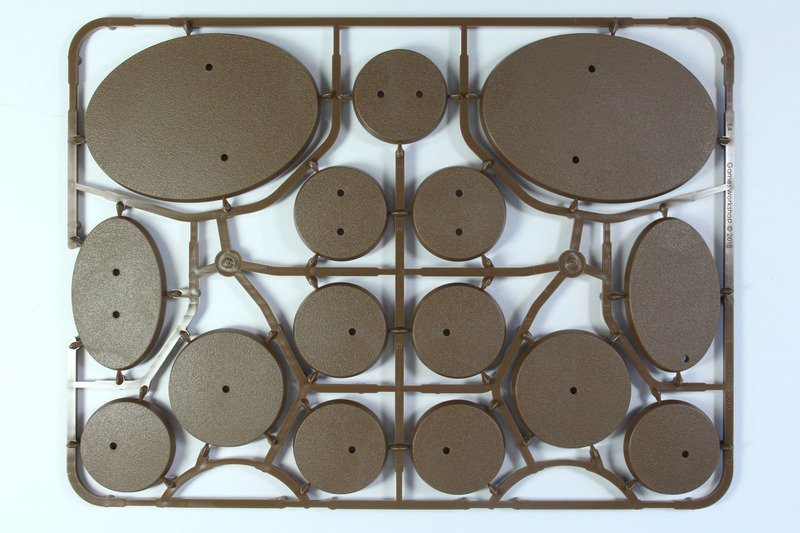 The model consists out of four parts and is a good fit. 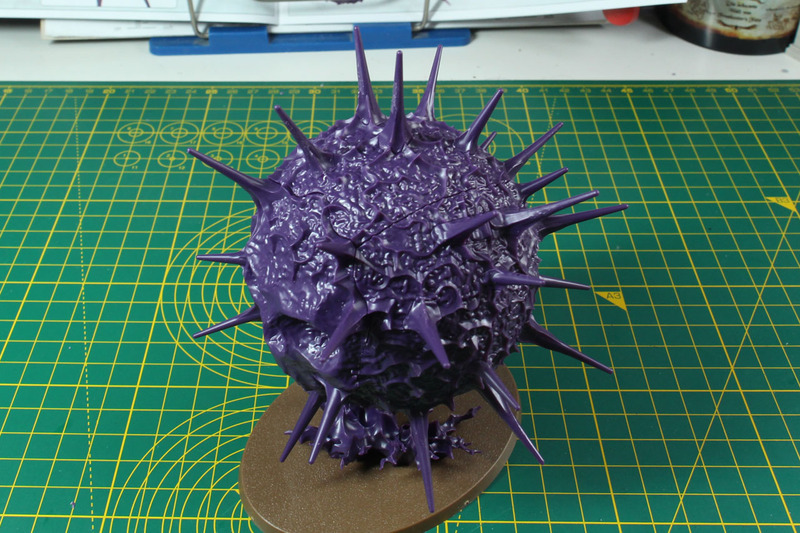 It has a very orkish feeling to it, reminding me of some older Waaagh! spells. 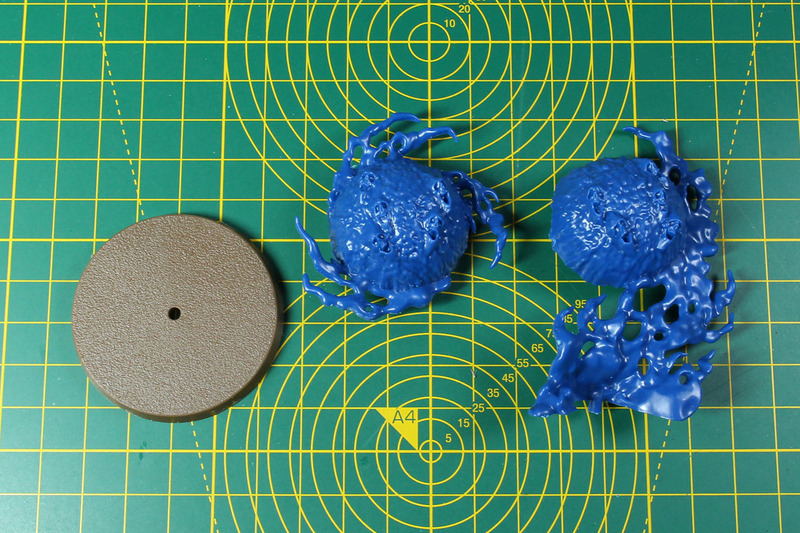 The damage value is moderate at D3 wounds, but it reduces the bravery by one and moves incredibly fast at 12". As this is a feral spell it benefits from being casts in the realm of beasts. 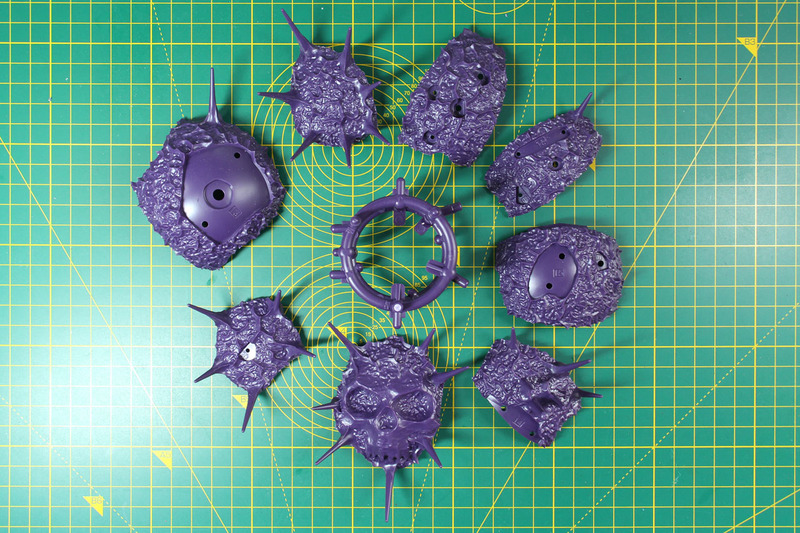 Beside the Purple Sun, all other miniatures are either one piece or at maximum four piece builds. 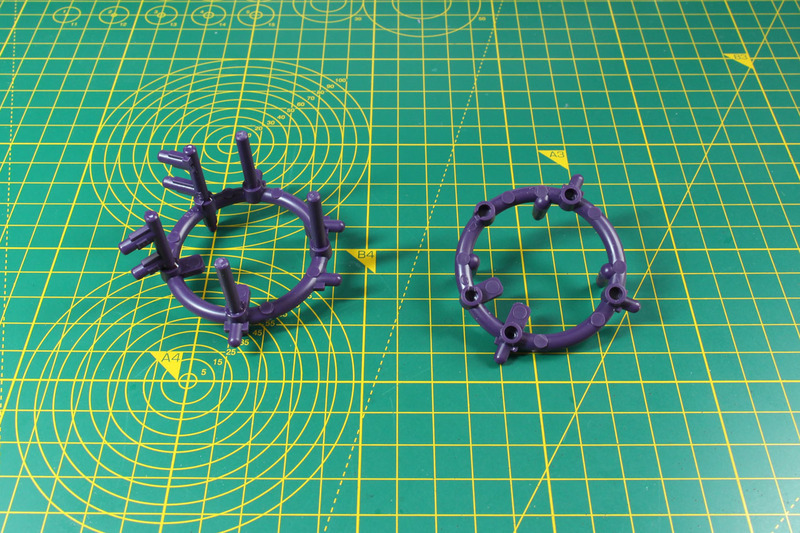 So fit is no issue, sometimes you have to add a bit of pressure as these are push-fit to really get it the connection joints together. 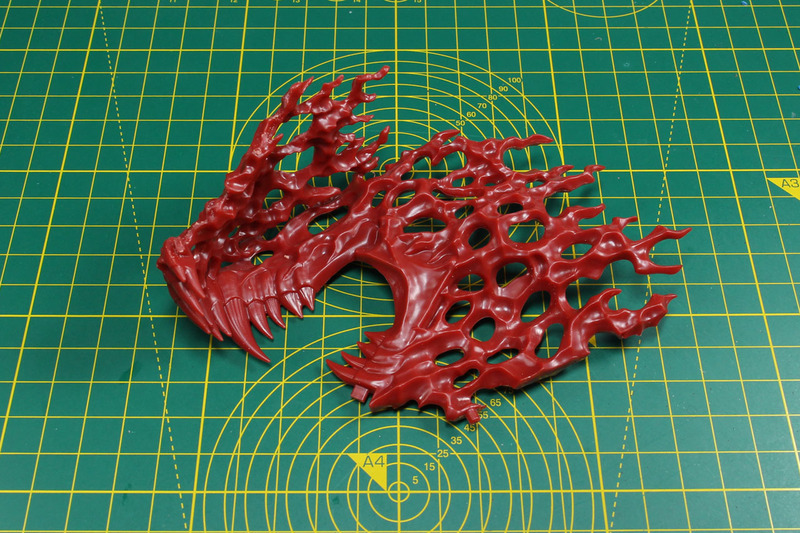 The casting is good, due to the organic shapes it is just a bit time consuming to remove all of the small mould lines. As they do not only occur on the outline of the parts but on all of the small intersections, within flames, chain links and such. 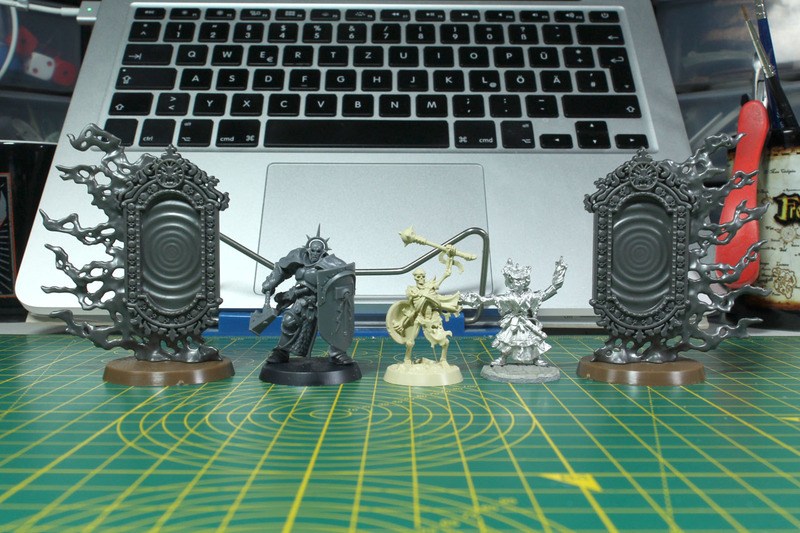 To get a feeling for the size of these spells, I took a few pictures next to a Stormcast Eternal, an undead Sepulchral Guardian and a sorcerer miniature from the Frostgrave range. 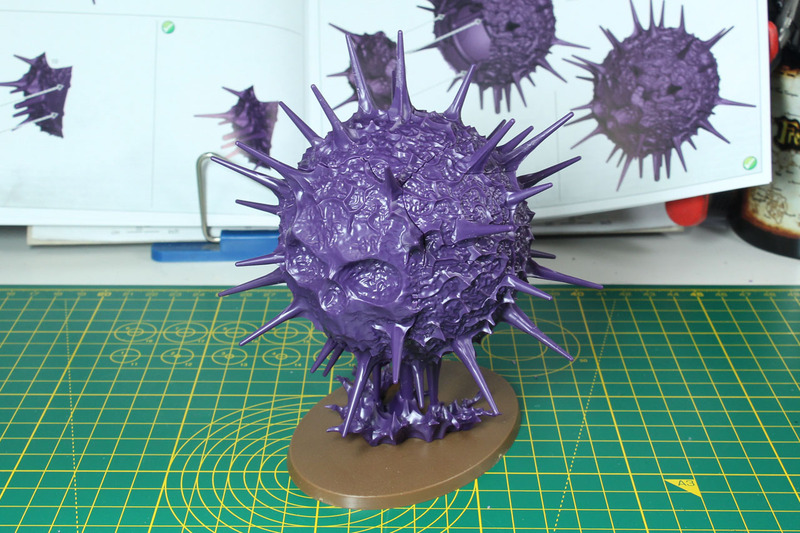 Some of the spells work quite well with 28-32 mm miniatures and could be used for other fantasy rule sets or skirmish easily, others like the Purple Sun or Gnashing Jaws are of such heroic scale, that they really only work within the Warhammer world. I expected the miniatures of the spells to be quite a bit smaller than they actually are. Is this a good thing or bad thing? 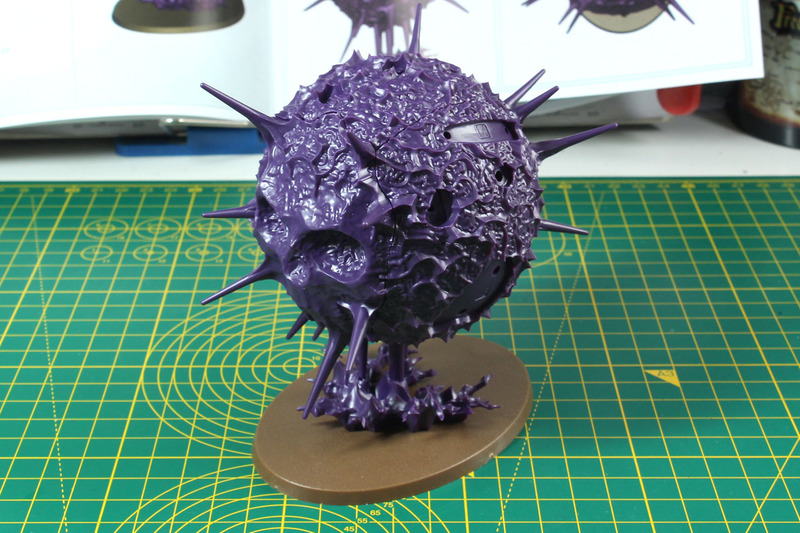 Purely from the point of view of Age of Sigmar, it is absolutely great. 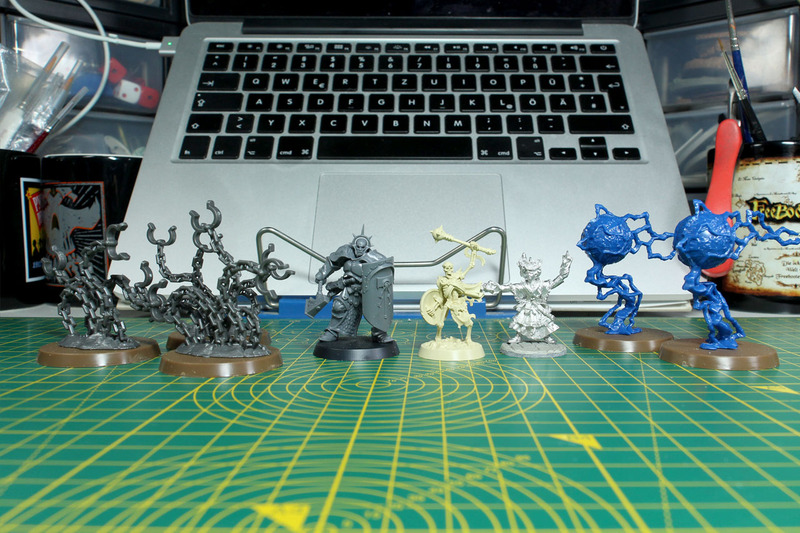 You get a huge amount of miniatures for your money. And as these are permanent spells that stay in the game and influence the battlefield, the units around them and such, you want them to be present. 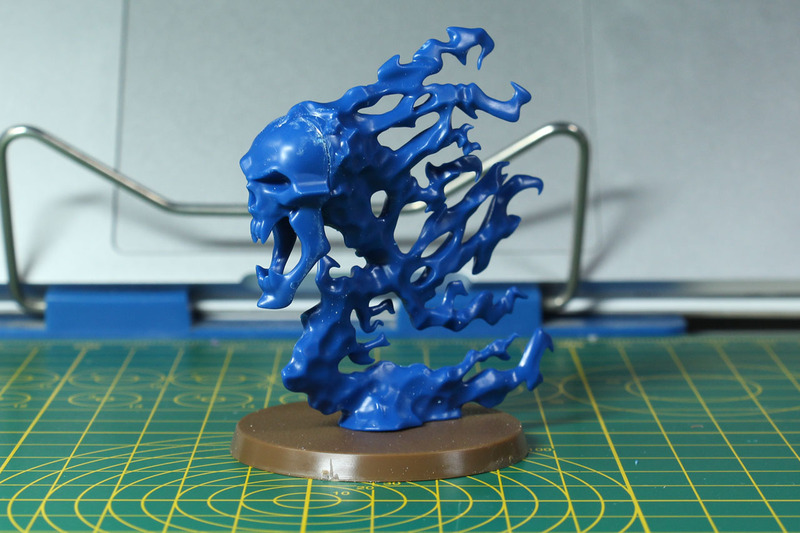 The best and easy way to achieve this is by modelling some amazing and large models for those spells. 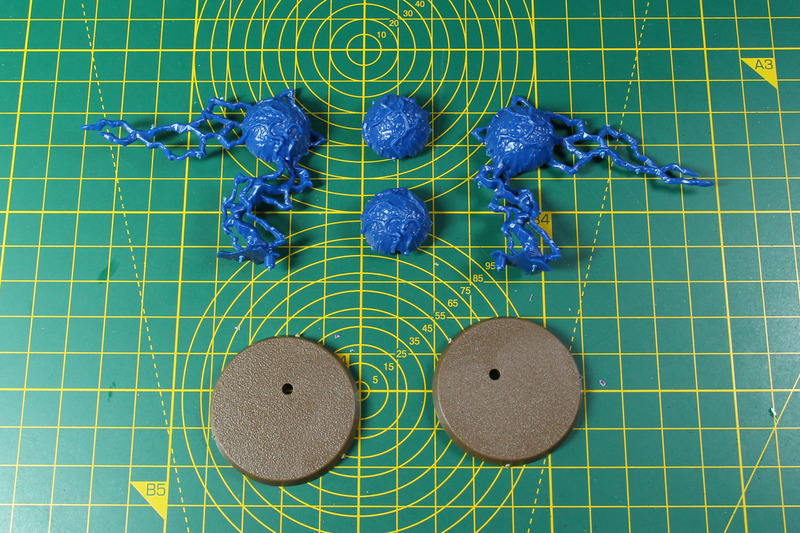 Not just putting down coloured dice, templates or some cut-outs to show the spell effect. This is a high quality kit and it presents a much better price performance ratio compared the older magic supplements (card decks that costs you 8-10 EUR per deck or the large Magic box at 40 EUR just with card board, no miniatures or similar) at 60 EUR. 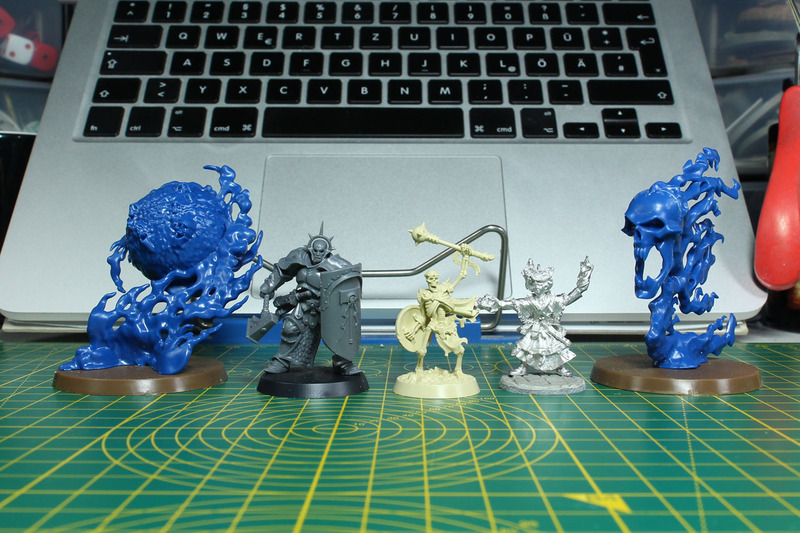 Especially if you keep in mind, that you do not only get miniatures, but a well written and designed softcover rulebook, that would cost 25 EUR individually and for 35 EUR on top you receive a huge set of appealing spell miniature. 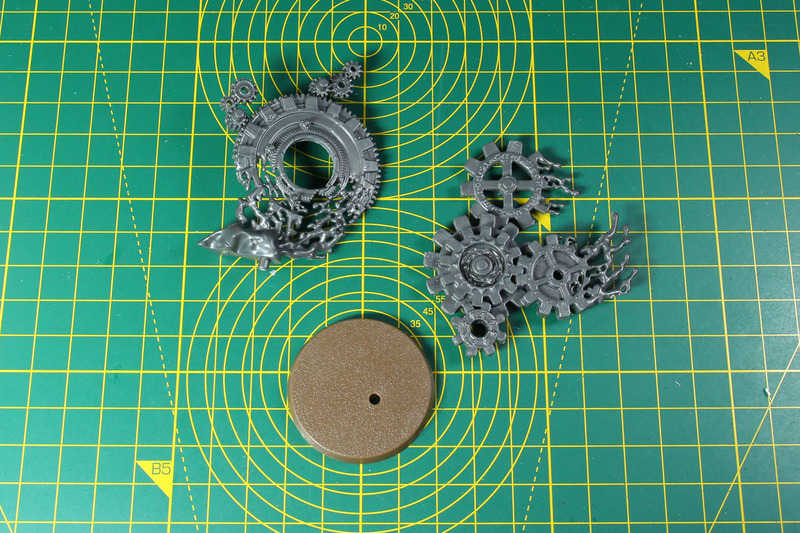 There will be additional spell boxes for the several factions, currently available are those for the Nighthaunts and Stormcast Eternals, with three permanent spells each at 25 EUR. 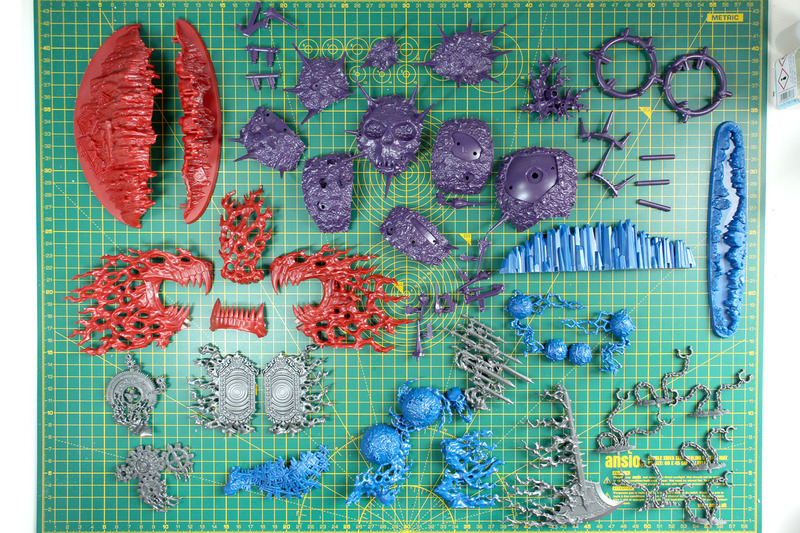 That adds up to 85 EUR for a magic supplement - for a single army project. 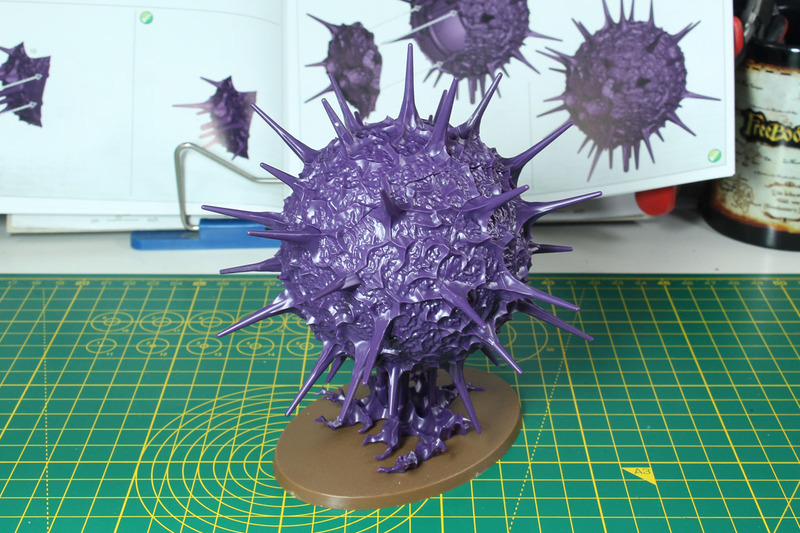 As Age of Sigmar was meant to be leaner than Warhammer, with a lower entry barrier - even though Malign Sorcery is a good product of its own - I am not sure how that really fits together. 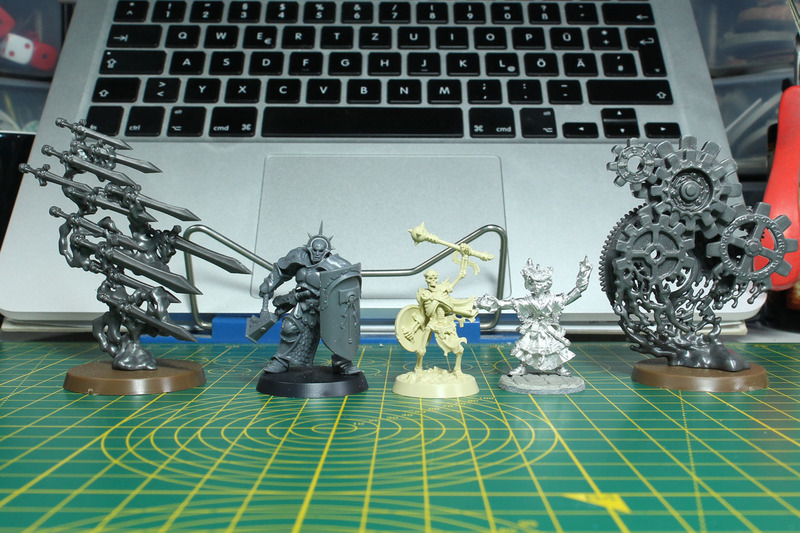 In addition the permanent spells increase the space you need in your army bag by a lot, as some of the spells are large and expansive in size. 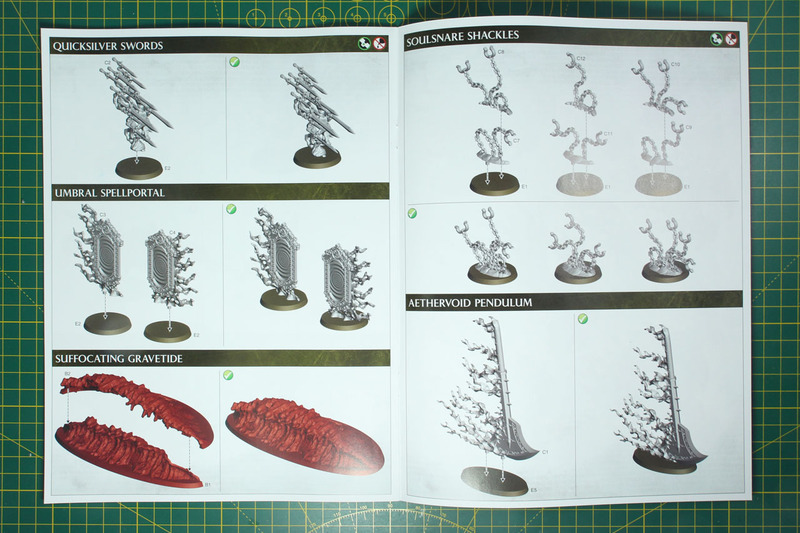 But all this growth of the rule set brings back a lot of the flair of the 7th and 8th edition of Warhammer, if you fancy it. 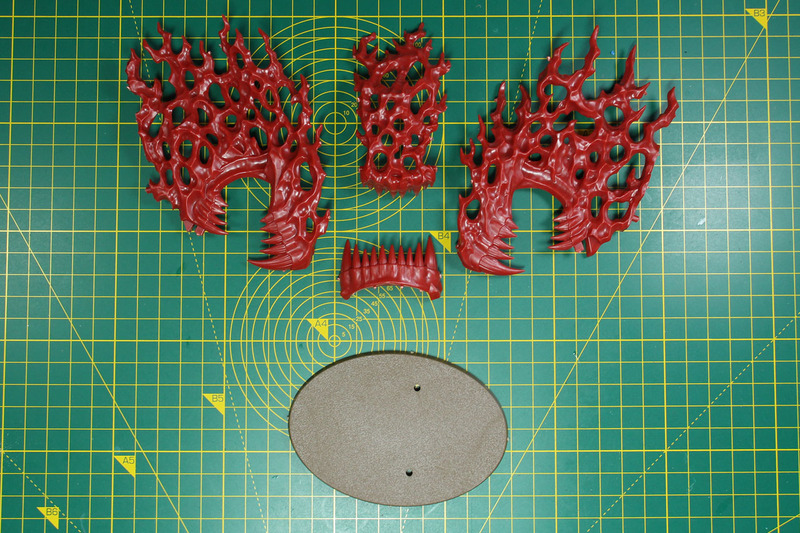 Similar to the multipurpose use of the Shattered Dominion Objectives, I thought about the general use of this kit in fantasy related rule sets that cover the use of magic. 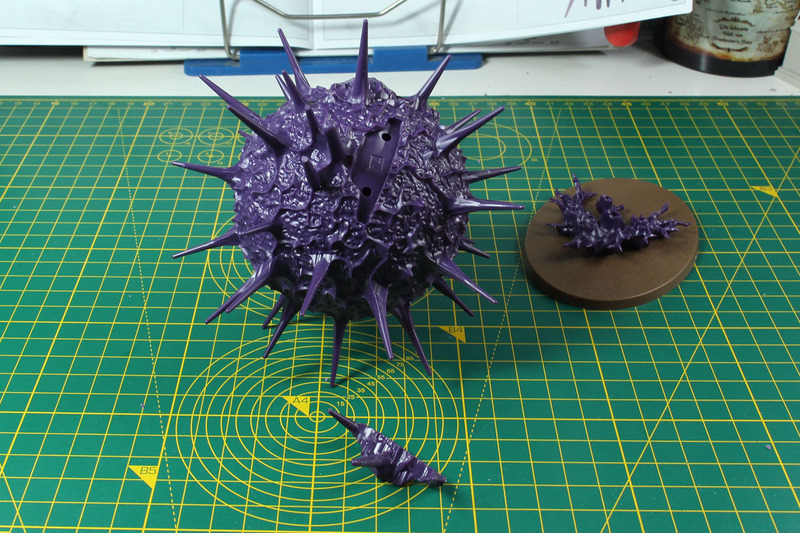 But due to the sheer size of some of the spells, many of them are just too big for a use outside of Age of Sigmar. Never the less, if you find someone to split the box (there are enough spells in there to satisfy 3 or more hobbyists) you still have a resource for what you're looking for at a reasonable rate. The book is, as mentioned above, well composed. 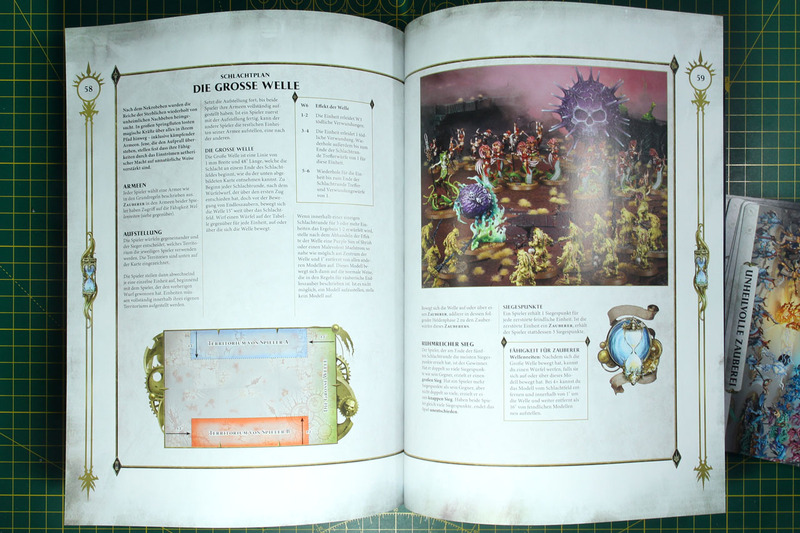 You have lots of artwork and diorama battle shots, the first half of the book is just lore, with every spell being presented in detail with at least half page introduction and artwork. There is a painting guide for the spells in there as well. 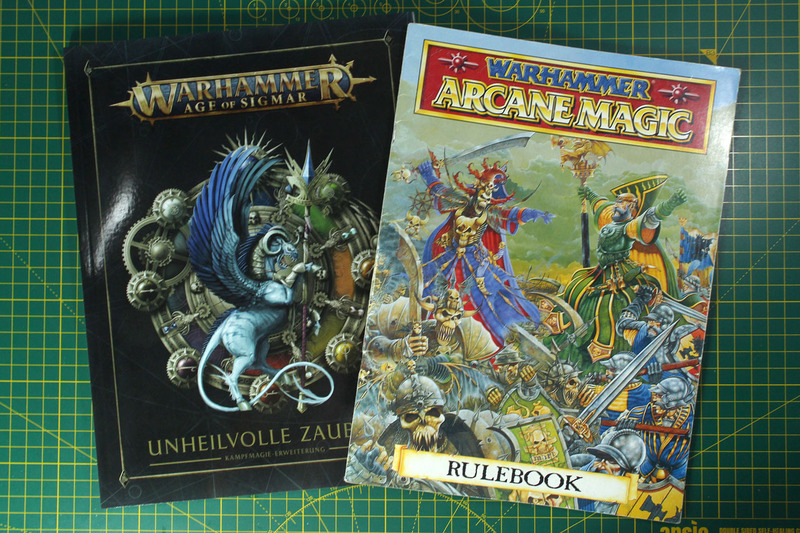 And the rules for Skirmish, Path to Glory and Age of Sigmar cover the second half of the book, including scenarios, spell lists and magic items. Very complete and solid magic supplement, with a good amount of content and high fantasy feeling. To my taste a much better and convincing solution as older publications on magic, and all that at a very reasonable price. Warhammer Age of Sigmar is a brand by Games Workshop.